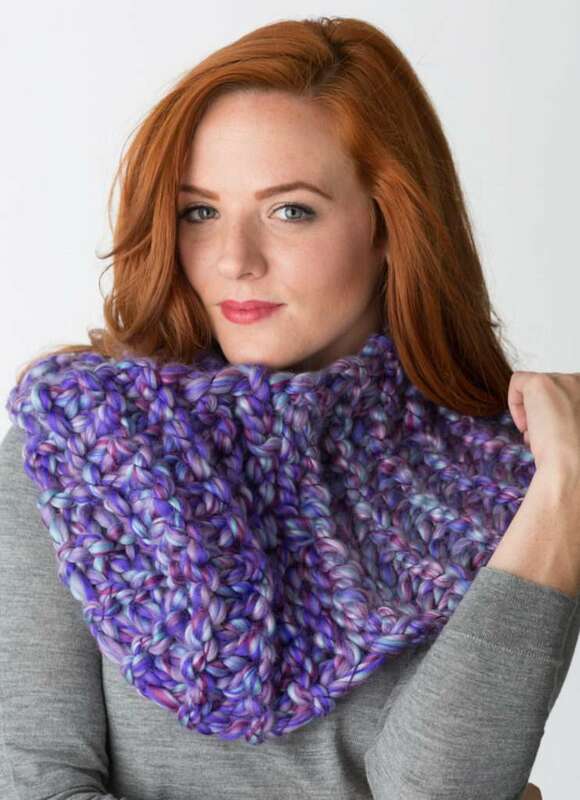 The zippy faux möbius scarf is very simple and fast to knit. Worked completely in garter stitch and then a simple twist creates a unique scarf. What is a möbius strip? It is a one-sided surface that is constructed from a rectangle by holding one end fixed, rotating the opposite end through 180 degrees, and joining it to the first end. Knitting loom: (3) Zippy Looms. Yarn: Approx: 60 yards of super bulky yarn. Loops & Threads Artisan was used in sample. Row 1: k to the end of row. Row 2: p to the end of row. Repeat Row 1 and Row 2: 25 more times. Twist the panel, place the cast on row back on the knitting loom. Each peg has two loops on it.Perform a basic bind off (treat the two loops on each peg as one loop). 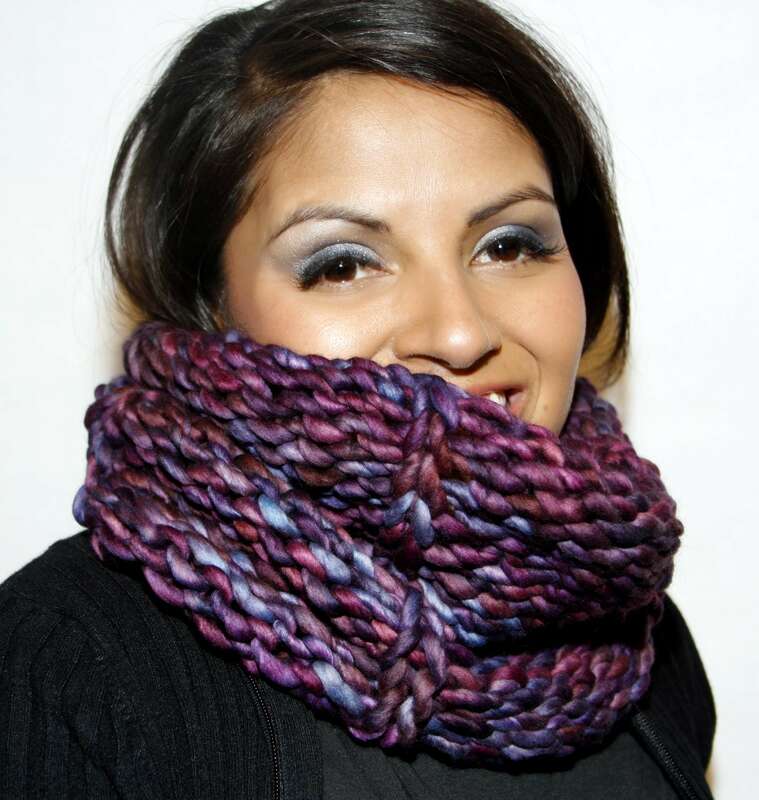 Keep away the chill with this sumptuous cowl as you walk around this fall season enjoying the crisp fall air. Knitting Loom: (6) Zippy Looms, (4) Zippy Corners. Yarn: 80 yards of Super Bulky wool. Malabrigo Rasta, shown in Abril was used in sample (less than 1 skein). Slwyb=Slip with yarn back. Skip peg with yarn towards the back of the peg. 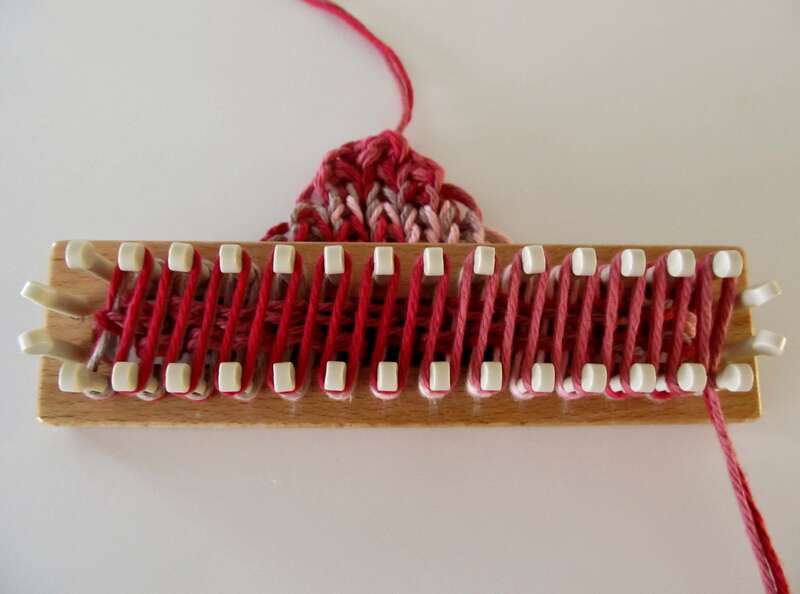 Set up knitting loom as shown on this picture: Use 1 connector to connect 2 zippy looms together, repeat with the other 2 Zippy looms. Place corners at each end of the two rails. Slide the remaining two Zippys at each end, connecting them to the rails with the corners. Cast on 28 sts using the ewrap cast on. Rnd 1: *p6, k1; rep from * to the end of rnd. Rnd 2: *p6, sl1wyb; rep from * to end of rnd. Repeat Rnd 1 and Rnd 2: until about 30 inches of yarn remain. Bind off loosely with basic bind off method. Using a superb self-striping yarn allows you to simply knit at your heart’s content without having to worry about color changes. YARN: Approx 275 yds of DK weight yarn. Viking Aurora Super Sock in color #668 was used in sample. NOTIONS: Knitting tool, tapestry needle, 2 double pointed needles size 2 (used for grafting the toe area close). SIZE: Fits a men’s size 9. To create larger/smaller sizes, work less rounds in the foot area. GAUGE: 12.5 sts x 16 rows= 2 inches in stockinette. 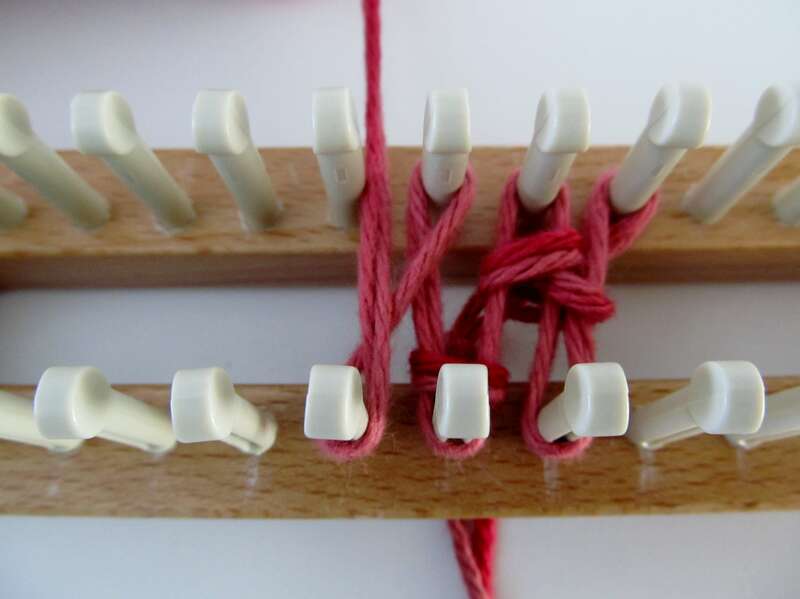 W&T=wrap and turn (remove stitch from the peg, wrap the yarn working yarn around the peg (take the yarn to the inside of the loom, then go around the peg so that working yarn ends up to the front of the loom)). Cast on 48 sts, prepare to work in the rnd. Rnd 1-16: *k2, p2; rep from * to end of rnd. Next 56 rnds: k to end of rnd. Knit from peg 23-2 (treat the wrap and the stitch as one loop). W&T peg 1 (two wraps and a stitch). Pegs 1 and 24 have the wraps and the stitch. 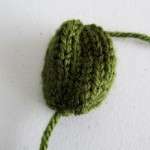 On the first round for the foot, work the wraps and the stitch together as a regular stitch. Next row: k to end of rnd. Rep last rnd until foot measures approx 8.5 inches from the end of heel (or 1.5 inches less than desired length). Rep short-row heel instructions for toe area. At the end, you will have Peg 1 and peg 24 with an extra wrap, lift this wrap up and off the peg. Remove stitches 48-25 and place stitches on one double pointed needle. Remove the remaining stitches from the loom and place them on second double pointed needle. Using the kitchener stitch, graft the toes close. Fall is finally here! Time to take out the scarfs, hats, and mittens! 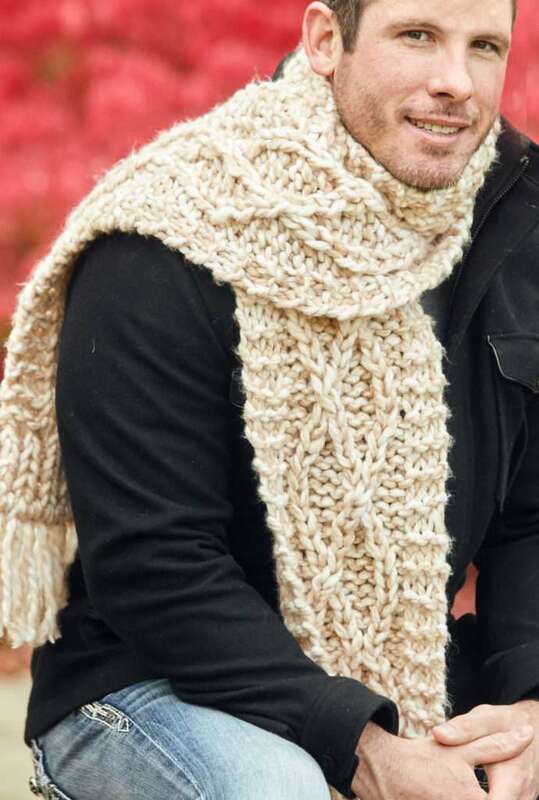 Perfect time to knit a luscious knit for the guys’ in our lives! 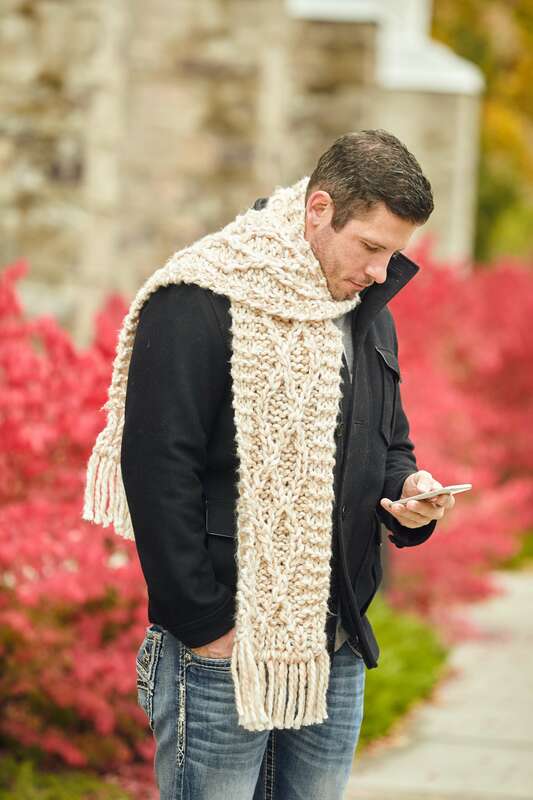 Whenever I think men knits, cables come to mind and this time with the Zippy loom to create a thick, warm scarf. 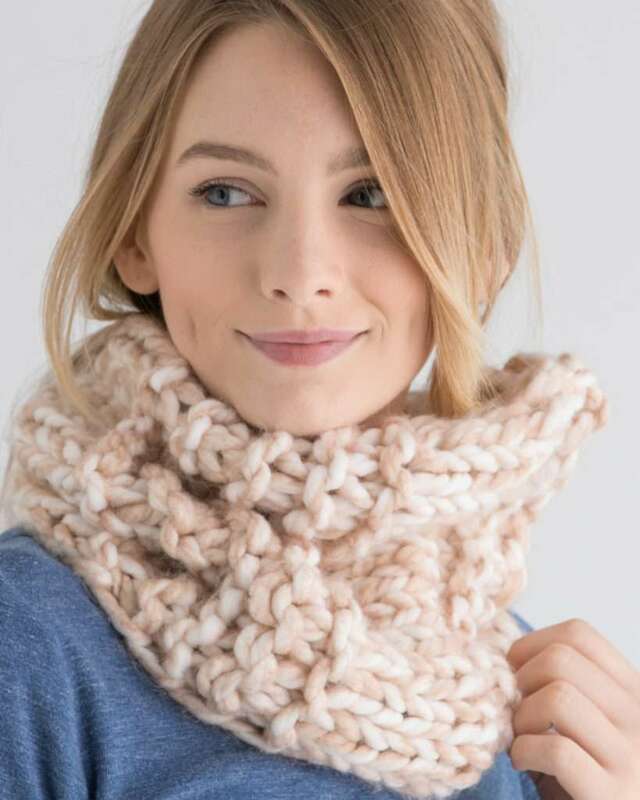 A simple, yet attractive rope cable twists around the body of this scarf. 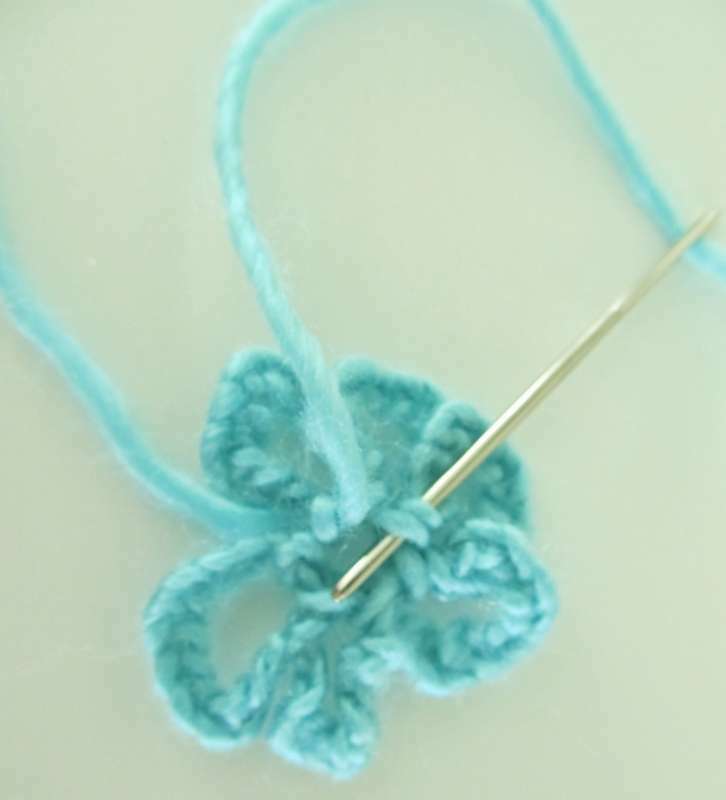 Although it looks intricate to create, the two stitch twists are rather simple and provide with a tight cable. YARN: Approx 225 yds of super bulky weight yarn (#7). Lion Brand Color Clouds yarn in Traveler’s Yarn was used in sample. NOTIONS: Knitting tool, tapestry needle, cable needle (optional). GAUGE: 5 sts and 8 rows = 4 inches in stockinette. RT=Take loop off first peg and hold it to the center of the loom on the cable needle. Knit peg 2. Move loop from second peg to peg 1. Place loop from cable needle on peg 2. Knit peg 2. LT=Skip peg 1 with yarn behind the peg. Knit peg 2. 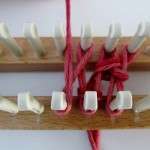 Move loop from peg 2 to cable needle and hold to center of loom. Knit peg 1. Move loop from peg 1 to peg 2. Place loop from cable needle on peg 1. RTP=Take loop off first peg and hold it to the center of the loom on the cable needle. Knit peg 2. Move loop from second peg to peg 1. Place loop from cable needle on peg 2. Purl peg 2. LTP=Skip peg 1 with yarn behind the peg. Purl peg 2. 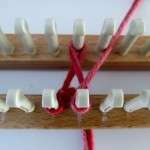 Move loop from peg 2 to cable needle and hold to center of loom. Knit peg 1. Move loop from peg 1 to peg 2. Place loop from cable needle on peg 1. Cast on 17 sts from right to left. First row will be worked from left to right. Row 1-4: *k1, p1; rep from * to last st, k1. Row 5: k3, p3, k2, p4, k1, p1, k3. Row 6: p3, p1, LTP, p2, RTP, LTP, p2, p3. Row 7: k3, p2, k1, p2, k1, p2, k1, p2, k3. Row 8: p3, p2, LTP, RTP, p2, LTP, p1, p3. Row 9: k3, p1, k1, p4, k2, p3, k3. Row 10: p3, p3, RT, p4, k1, p1, p3. Row 11: k3, p1, k1, p4, k2, p3, k3. Row 12: p3, p2, RTP, LTP, p2, RTP, p1, p3. Row 13: k3, p2, k1, p2, k1, p2, k1, p2, k3. Row 14: p3, p1, RTP, p2, LTP, RTP, p2, p3. Row 15: k3, p3, k2, p4, k1, p1, k3. Row 16: p3, p1, k1, p4, LT, p3, p3. Rep Row 5-16 until you have reached approx. 66 inches from cast on edge. Next 4 rows: *k1, p1; rep from * to last st, k1. Fringes: Cut 34 pieces of yarn that are about 10 inches in length each. Add 17 fringes to cast on edge. Add the remaining 17 fringes to the bind off edge. 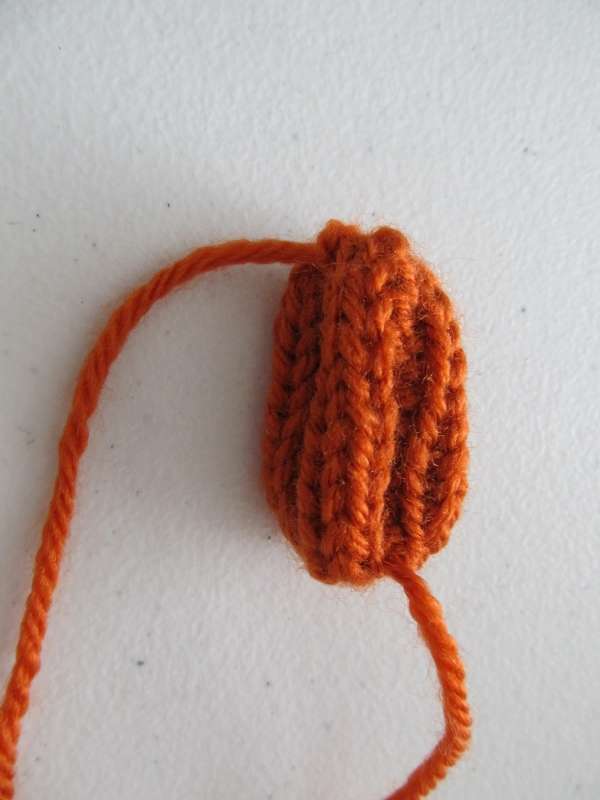 Fold the strand of yarn for one fringe in half, forming a small loop at one edge (make sure the ends on the other end of the strand match in length). 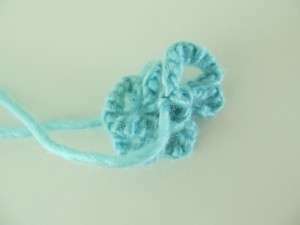 Use crochet hook and draw the loop through the single crochet stitch where you are attaching the fringe to. 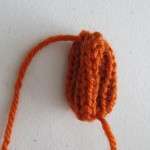 Tighten the knot by pulling gently on the fringe ends with your hand and holding the knot with the other hand. Trim the ends if necessary to make all the tassels/fringes the same length. Summertime is here and with it the promises of hiking through the high mountain tops and discovering new streams and meadows. 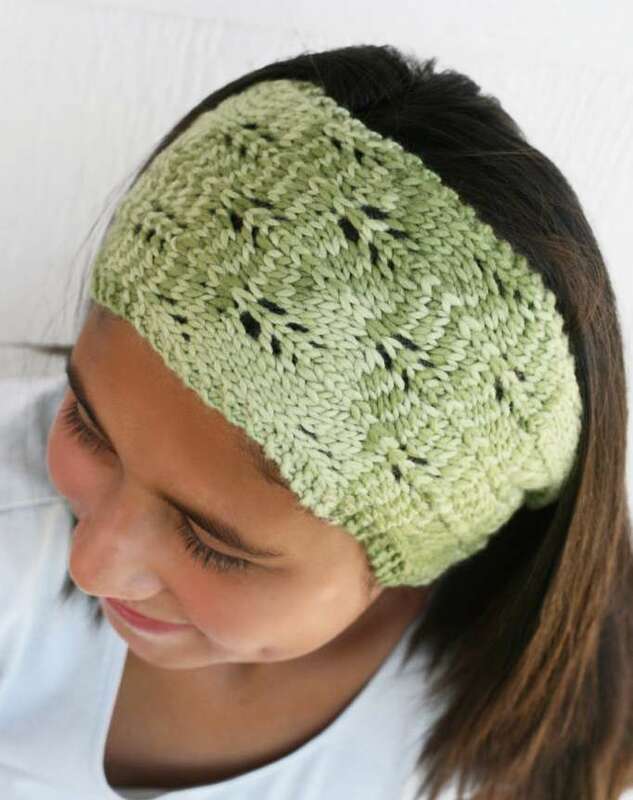 Keep your hair in check with the trellis headband that blends in with the foliage. YARN: Approx 60 yds of worsted weight merino wool. Knit Picks Preciosa Tonal in Tadpole was used in sample. Set knitting loom with the spacers at opposite ends–you will be using 25 pegs. Cast on 25 sts, prepare to work a flat panel. Row 1 (going from right to left (clockwise) on the loom): k to the end of row. Row 3: k2, k1, *yo, k3, CDD, k3, yo, k1; rep from * to last 2 sts, k2. Row 4 (and all even rows): p2, k to last 2 sts, p2. Row 5, 7, 9: Rep Row 3. Row 11, 13, 15, 17: k2, k2tog, *k3, yo, k1, yo, k3, CDD; rep from * to last 11 sts, k3, yo, k1, yo, k3, ssk, k2. Row 18: p2, k to last 2 sts, p2. Repeat Rows 3 to 18 until piece measures 12” from CO edge. **Next row: k1, k2tog, k to last 3 sts, ssk, k1. Next row: p to end of row. Rep last 2 rows until 5 sts rem. On the cast on edge, pick up 25 stitches and place them back on the knitting loom. Rep from ** to **. Need extra assistance with the lace rows? We’ve got you covered! Keep reading below for extra assistance. 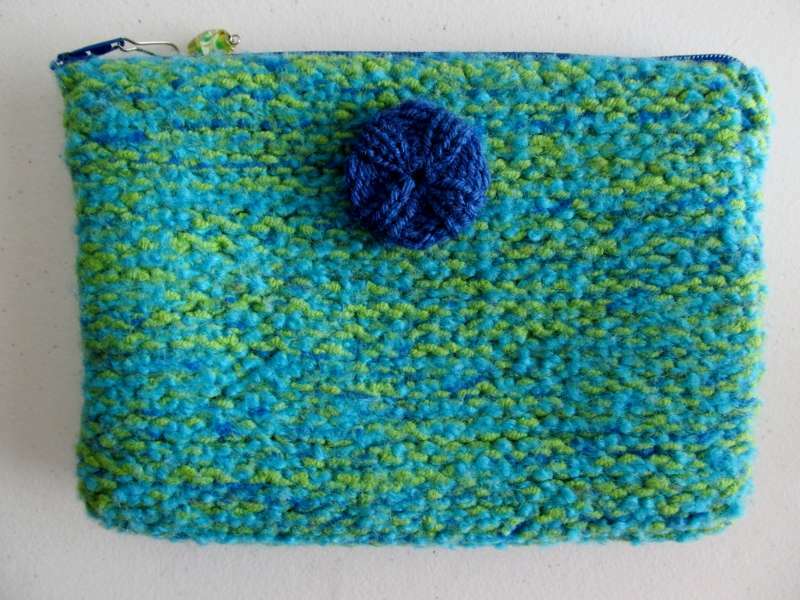 Knit a fashionable iPad cozy to keep your iPad safe from bumps. 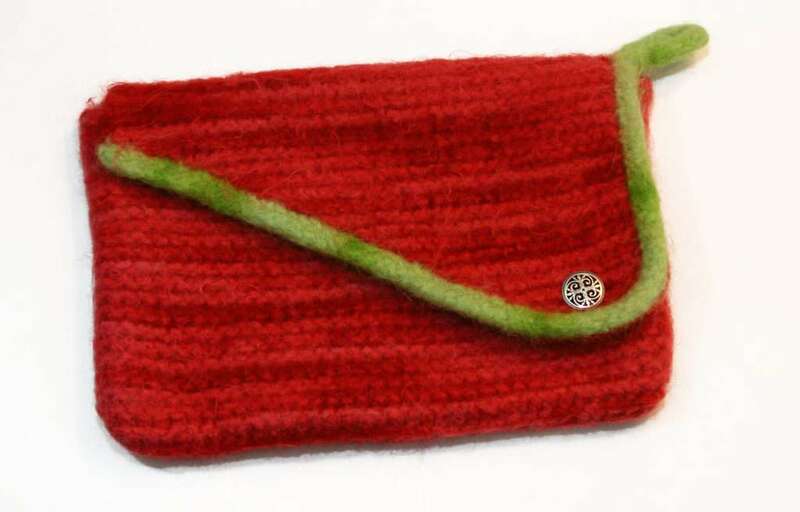 The felted material also protects the iPad from unwanted spills. YARN: Approx 275 yds of wool mohair blend bulky weight yarn. Lamb’s Pride Bulky in Cranberry Swirl (250yds) and Lime Sorbet (25 yds) was used in sample. GAUGE: 3.5 sts x 4 rows = 2 inches. Using MC, cast on 36 sts, prepare to work a flat panel. Row 1: ewrap k to end of row. Row 2: p to end of row. Row 1 and Row 2=1 Garter Stitch ridge. Next row: ewrap k to end of row. Next row, BO 2, p to end. (Place a row marker at this point). Rep last 2 rows until 8 sets rem. BO with basic bind off method. Fold the panel so that the cast on edge lines up with the row that has the stitch marker. Using tapestry needle and MC, mattress stitch down the sides. Weave ends in. Using CC, work a 3-stitch i-cord that is approximately 24 inches long. Using tapestry needle and CC, mattress stitch the i-cord to the tapered flap of the bag, starting at the beginning of the tapered edge, loop the end of the i-cord to form a loop, secure to the edge of the flap. After felting (see instructions below for felting), fold the flap over to see where to place the button. Sample shows button at the bottom right of the flap. Sew the button in place to the bottom part of the bag. Fold flap over, with a knife of scissors make an opening to the flap, big enough to allow the button to pass through. The magic in this knitting happens when you wash the untreated wool with hot water and the item shrinks, making the stitches smaller, and the fabric thicker. Towels (to squeeze out excess water). Place all items to be felted inside the zippered pillow case. Secure the zipper with the safety pin (to ensure the pillow case doesn’t open). Set washer to Small load, and Hot temperature. Place 1 tsp of Eucalan Woolwash or 1 tsp of Baby Shampoo. Place the jeans inside the washer. Place the pillow case inside the washer. Start the washer. Check the washer again BEFORE it goes into the spin cycle. If the item is not the desired size, re-start the washer from the beginning (simply turn the knob back to the beginning of the wash). Place the pillow case back in the washer and let it go through another cycle, stopping the washer BEFORE it was through the spin cycle. Check again. If not desired size, repeat. *The above samples took 3 cycles. Once the items are the desired size, remove the items from the pillow case. Take them to the sink. If you used Eucalan Woolwash, rinsing is not required. If you used Baby Shampoo, rinse in cold water. Do not wring the excess water. 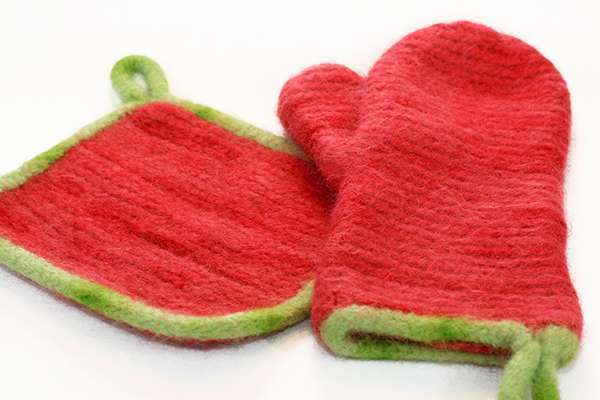 Place a towel on a flat surface, then place the felted item on top of the towel. Pat dry as much as you can. Set the items to air dry, away from the sun. The sun may discolor the yarn. Celebrate the arrival of Spring with this sweet little flower. 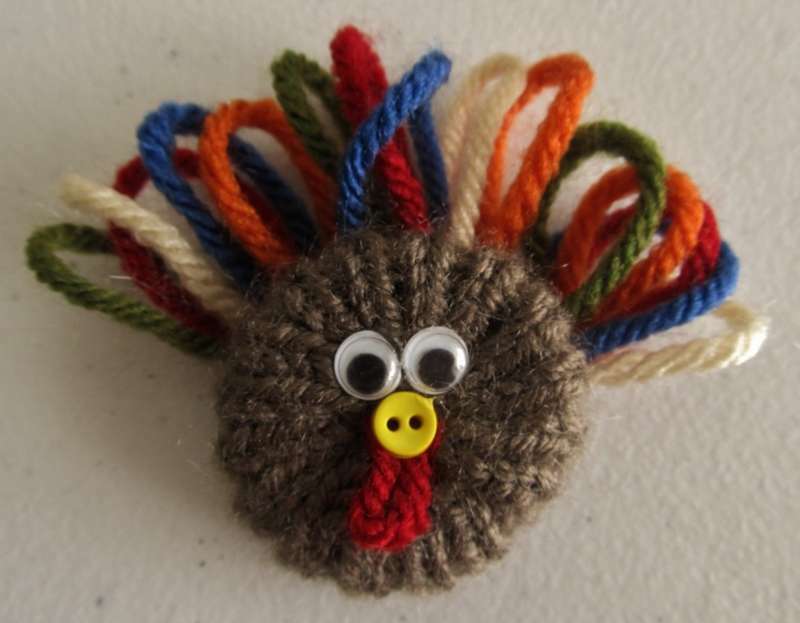 This fun project is a quick and easy way to use up small yarn remnants from other projects. Use these pretty blossoms to embellish anything from hats, hair bows, headbands, afghan squares, refrigerator magnets, wreaths, etc. Yarn: Approximately 5 yards of worsted weight yarn. Notions: knitting tool, scissors, yarn needle. Row 8: K2, K2Tog, K1. Row 9: K1, K2tog, K1. Row 12: Skip the stitch on the loom and cast on 2 new stitches. The first petal of the flower is now complete. 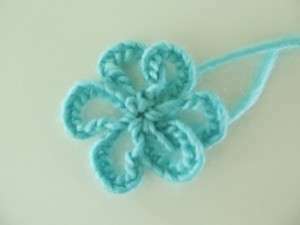 Repeat rows 1-12 until you have a total of 4 petals. Repeat rows 1-10 once more. Bind off all stitches, leaving a long yarn end. Thread the long yarn end into the yarn needle. Work a running stitch along the full length at the base of the petals. 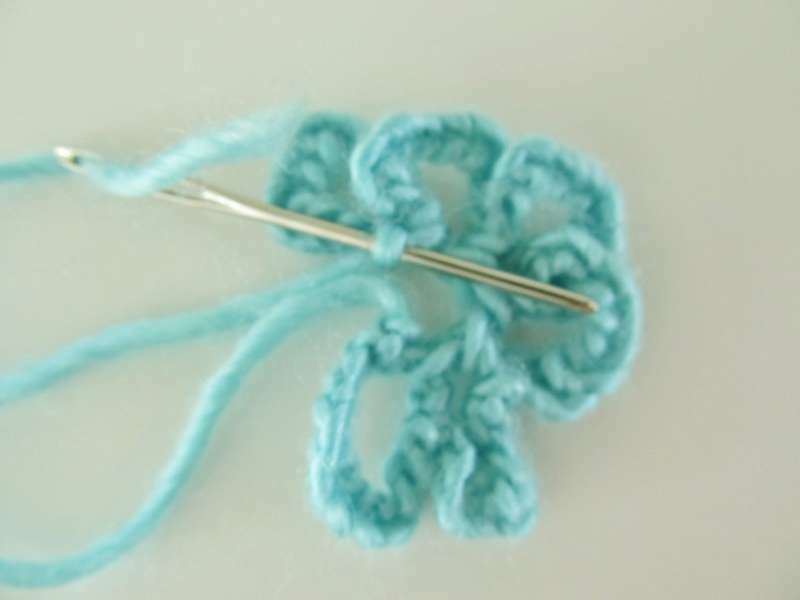 Pull the yarn end to tightly gather the center of the flower. Use the yarn end to join the base of the last petal to the base of the first petal. Weave in the yarn ends and the little flower is done! How on earth do you knit the hoxey cowl please share the method. Hello Maureen. I see that this is a pattern from Interweave Knits. 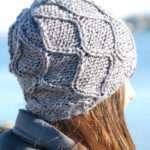 Have you tried sending a message to Interweave Knits, or to the designer of the Hoxey Cowl? Hello. This is a random question, but do you sell any of your work? If so, how to you calculate the price of each piece? Thanks. I calculate my work per hour. If I design the item, I calculate a design fee, then if I have to knit the item, I charge a set fee per hour. Consequently, my knitted items have a design fee+knitting fee+yarn cost. Creating last minute gift with the Zippy loom is a breeze! LOOM: Zippy Master Set Option: 4 Zippy and connectors. 4 Zippy and (4) corners. YARN: Approx 80 yds of Jumbo (size 7) acrylic yarn. Lion Brand Color Clouds in Travelers Tan was used in sample. 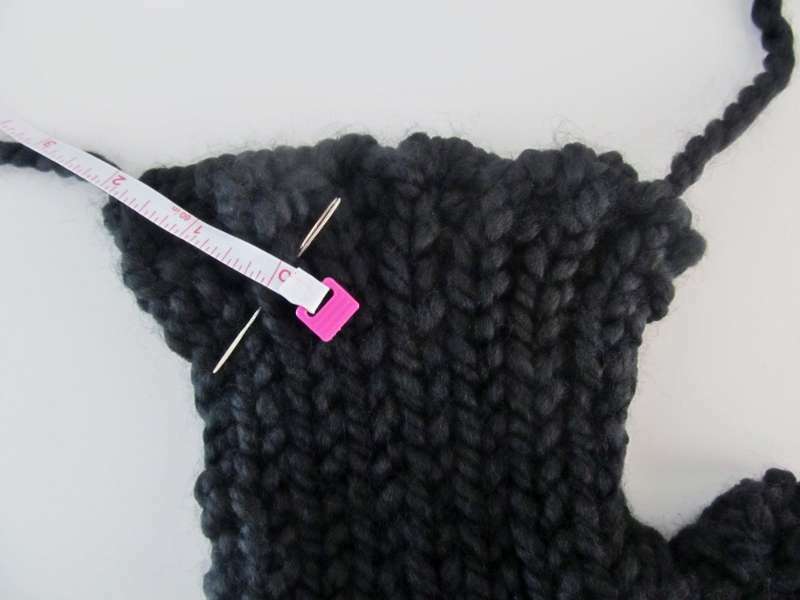 GAUGE: 4.25sts x 6 rows = 4 inches. SIZE: 11” wide x 18” long. Set Zippy loom to work in the round (4) Zippy and (4) Corners. CO 16 sts, prepare to work a flat panel. Rnd 1-Rnd 7: k to end of row. Rnd 8: p to the end of row. Rnd 9: k to end of row. Rep Row 8-Row 9: 4 times. Rep Rows 1-9: 2 more times. Next: Bind off with basic removal method, leaving a 16 inch yarn tail. Mattress stitch the cast on edge to bind off edge. Weave ends in. Block lightly. Love is in the air this month and hearts in all colors, shapes, and mediums abound. 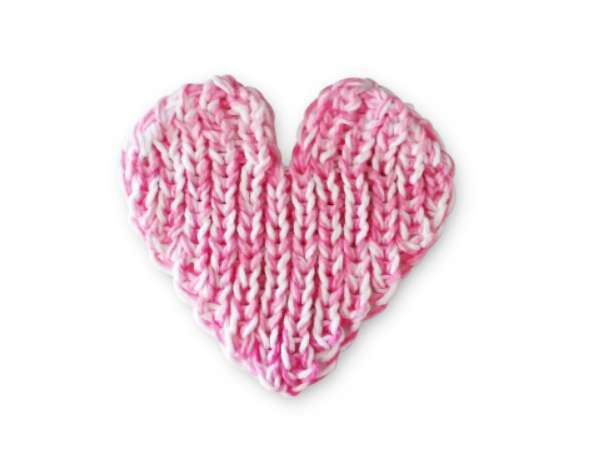 Get ‘cotton love’ with these adorable double-knit cotton hearts. Because they work up so quickly, you’ll have time to make one for all of the sweethearts in your life. Yarn: 100 % cotton yarn in worsted weight. Peaches & Crème and Sugar n Cream cotton yarns were used in the samples. Notions: knitting tool, yarn needle, scissors. Gauge: Not essential for this project. Duplicate Zigzag Stitch: The Duplicate Zigzag Stitch (DZ st) is worked on both sides of the knitting board/loom. The wraps will travel at a slight slant. In this stitch pattern, one peg at the beginning of each row will serve as a sort of turning peg and will not be wrapped. When working from left to right, the turning peg is the first peg on the lower board. When working from right to left, the turning peg is the last wrapped peg on the upper board. Wrapping in DZ st, l-r: (Working yarn will be at the first wrapped peg on the lower board). Take the working yarn to the upper board and around the nearest wrapped peg. Take the working yarn back down to the lower board and around the nearest wrapped peg. Continue working in this manner until all pegs have a second wrap on them, except the turning peg. Knit the pegs that have two wraps on them. Wrapping in DZ st, r-l: (Working yarn will be at the last wrapped peg on the upper board). Take the working yarn down to the lower board and around the nearest wrapped peg. Take the working yarn back to the upper board and around the nearest wrapped peg. Continue working in this manner until all the pegs have a second wrap on them, except the turning peg. Work back and forth across the board in DZ st until the knitted fabric reaches the desired length, or as directed in the pattern. *This project is double knit. This means that the project will be worked back and forth, using the upper and lower board of the loom. Lower board = the rail and pegs closest to you. Upper board = the rail and pegs farther from you. The board will not be rotated, so the lower board and the upper board will not change. For this project, disregard the 2 pegs at each end of the knitting loom. 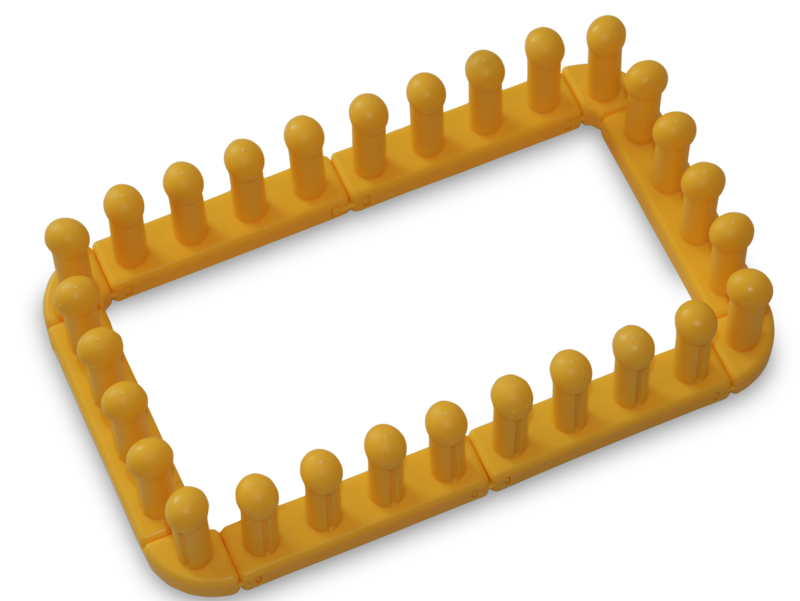 They are not included in the peg counts for this design. So, peg one of the lower board would be the first peg on the left hand side of the rail closest to you. *Work with 2 strands of yarn held together as one throughout this project. 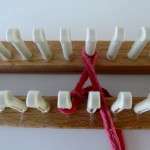 Make a slip knot and place it on the 7th peg of the lower board. Wrap the 8th peg on the upper board in a counter clockwise direction. Wrap the 8th peg on the lower board in a clockwise direction. Wrap the 9th peg on the upper board in a counter clockwise direction. Work in DZ st, r-l. Knit all pegs with 2 sets of stitches on them. Cast on is now complete. Wrap peg 7 on the upper board in a clockwise direction. Wrap peg 6 on the lower board in a counter clockwise direction. Work in DZ st, l-r. Knit all pegs with 2 sets of stitches on them. Wrap peg 9 on the lower board in a clockwise direction. Wrap peg 10 on the upper board in a counter clockwise direction. Wrap peg 6 on the upper board in a clockwise direction. Wrap peg 5 on the lower board in a counter clockwise direction. Wrap peg 10 on the lower board in a clockwise direction. Wrap peg 11 on the upper board in a counter clockwise direction. Wrap peg 5 on the upper board in a clockwise direction. Wrap peg 4 on the lower board in a counter clockwise direction. Wrap peg 11 on the lower board in a clockwise direction. Wrap peg 12 on the upper board in a counter clockwise direction. Wrap peg 4 on the upper board in a clockwise direction. Wrap peg 3 on the lower board in a counter clockwise direction. Wrap peg 12 on the lower board in a clockwise direction. Wrap peg 13 on the upper board in a counter clockwise direction. Wrap peg 3 on the upper board in a clockwise direction. Wrap peg 2 on the lower board in a counter clockwise direction. Wrap peg 13 on the lower board in a clockwise direction. Wrap peg 14 on the upper board in a counter clockwise direction. Wrap peg 2 on the upper board in a clockwise direction. Wrap peg 1 on the lower board in a counter clockwise direction. Move the stitch from peg 7 on the lower board to peg 6 on the lower board. Move the stitch on peg 1 of the lower board to peg 2 of the lower board. Move the stitch on peg 2 of the upper board to peg 3 of the upper board. Work in DZ st, l-r until peg 6 on the lower board has been wrapped and peg 7 on the upper board has been wrapped. Knit all pegs with 2 sets of stitches on them. Move the stitch on peg 2 of the lower board to peg 3 of the lower board. Move the stitch on peg 3 of the upper board to peg 4 of the upper board. Move the stitch on peg 3 of the lower board to peg 4 of the lower board. Move the stitch on peg 4 of the upper board to peg 5 of the upper board. Move the stitch on peg 4 of the lower board to peg 5 of the lower board. Move the stitch on peg 5 of the upper board to peg 6 of the upper board. Move the stitch on peg 5 of the lower board to peg 6 of the lower board. 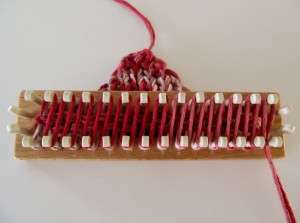 Move the stitch on peg 6 of the upper board to peg 7 of the upper board. Knit the stitches on peg 6 of the lower board and peg 7 of the upper board. 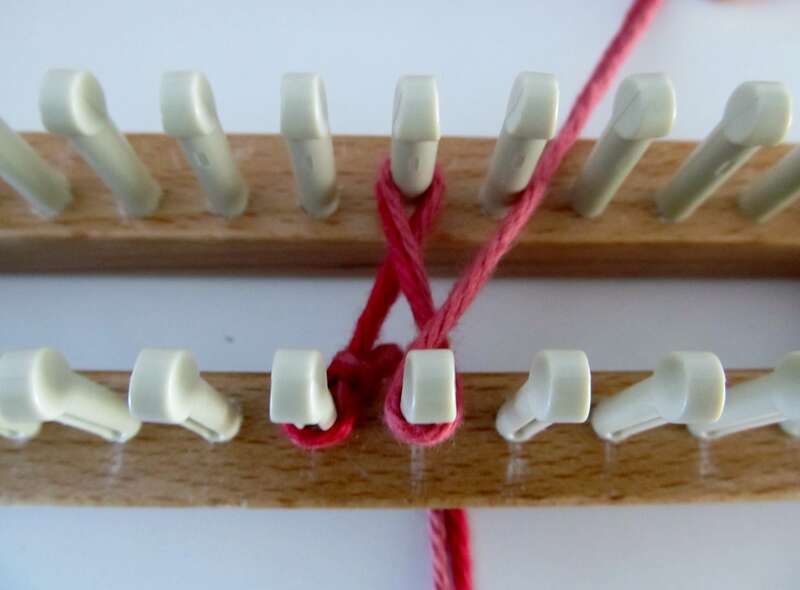 Move the stitch on peg 6 of the lower board to peg 7 of the upper board. Knit the stitch on peg 7 of the upper board. Cut the working yarn, leaving a yarn tail measuring about 4”. Using the yarn tail, knit peg 7 of the upper board. Pull the yarn tail up through the stitch, removing it from the loom. Pull the yarn tail to tighten and secure this final stitch. The left curve is now bound off. 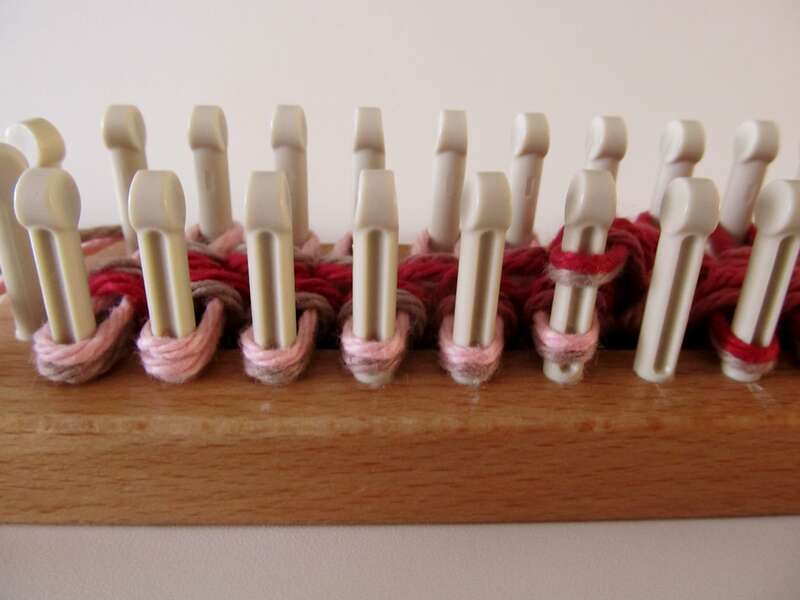 Move the stitch from peg 8 on the upper board to peg 9 on the upper board. Working with 2 strands held together as one, reattach the yarn at the right hand side of the loom, beginning at peg 13 of the lower board. Move the stitch on peg 13 of the lower board to peg 12 of the lower board. Move the stitch on peg 14 of the upper board to peg 13 of the upper board. Work in DZ st, r-l until peg 9 on the upper board has been wrapped and peg 8 on the lower board has been wrapped. Knit all pegs with 2 sets of stitches on them. Move the stitch on peg 12 of the lower board to peg 11 of the lower board. Move the stitch on peg 13 of the upper board to peg 12 of the upper board. Move the stitch on peg 11 of the lower board to peg 10 of the lower board. Move the stitch on peg 12 of the upper board to peg 11 of the upper board. Move the stitch on peg 10 of the lower board to peg 9 of the lower board. Move the stitch on peg 11 of the upper board to peg 10 of the upper board. Move the stitch on peg 9 of the lower board to peg 8 of the lower board. 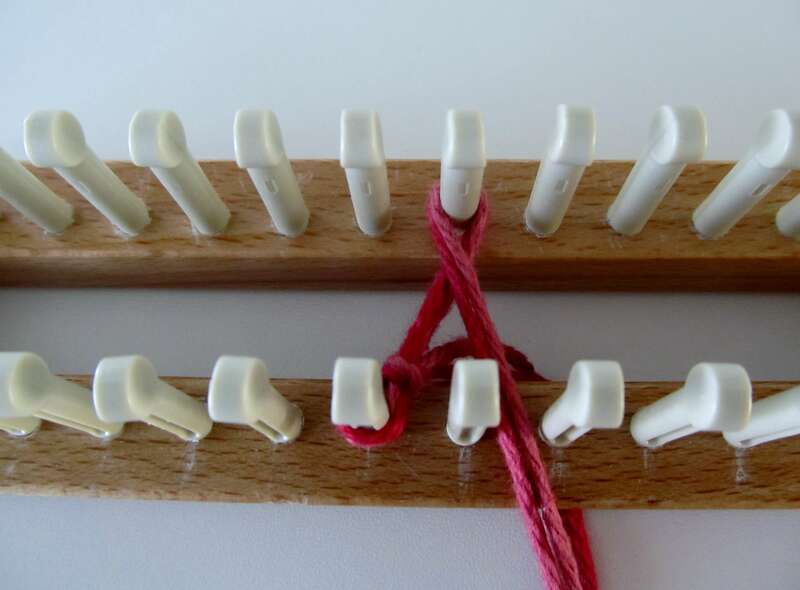 Move the stitch on peg 10 of the upper board to peg 9 of the upper board. Knit the stitches on peg 8 of the lower board and peg 9 of the upper board. 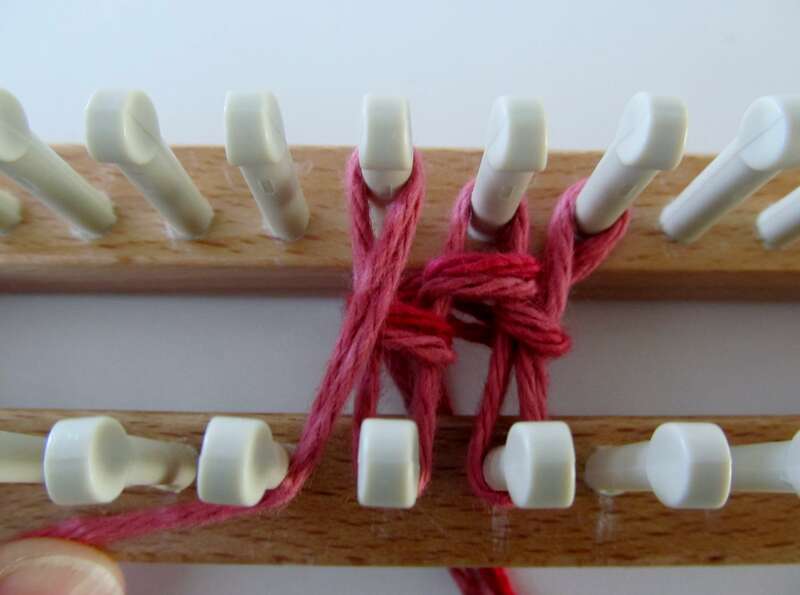 Move the stitch on peg 8 of the lower board to peg 9 of the upper board. Knit the stitch on peg 9 of the upper board. Cut the working yarn, leaving a yarn tail measuring about 4”. Using the yarn tail, knit peg 9 of the upper board. Pull the yarn tail up through the stitch, removing it from the loom. Pull the yarn tail to tighten and secure this final stitch. The right curve is now bound off. Weave in all yarn ends. 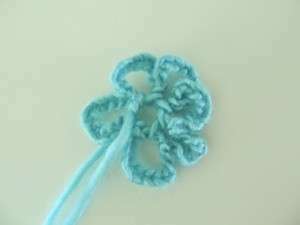 So quick, so fun, make a ton of cotton loves! This is really hard to figure out without some short tutorials. ? 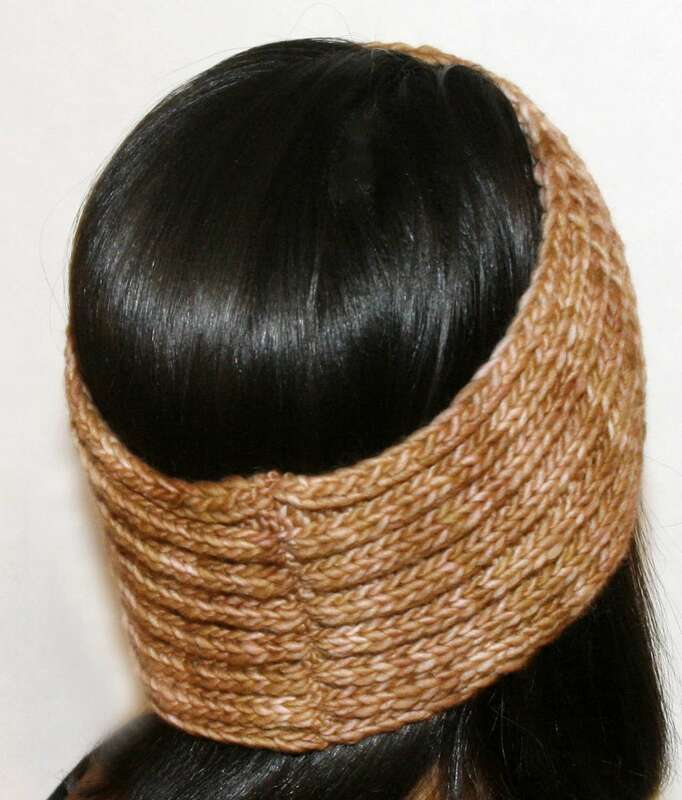 Loom Knitting Advent, Day 13 brings you a lovely headband, perfect accessory for winter wear. 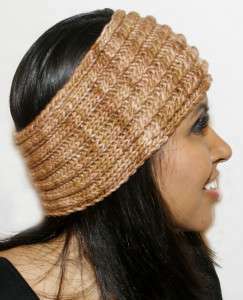 The headband sports small stitch twists in the front area of the headband and the back is worked in rib stitch. Yarn: Approx 200 yards of worsted weight merino wool. Malabrigo Worsted in Applewood was used in samples. LT: Left twist: A twist over two pegs; numbered and positioned as follows: Peg 2, Peg 1. How to: Skip peg 1 with yarn behind peg, knit peg 2, take loop off peg 2 and hold it, knit peg 1. Move loop from peg 1 to peg 2. Place loop being held to peg 1. Row 1-Row 36 (approx. 5 inches): sl1, k1, *p2, k2; rep from * to the end row. Row 38: sl1, k1, *p2, k2; rep from * to the end. 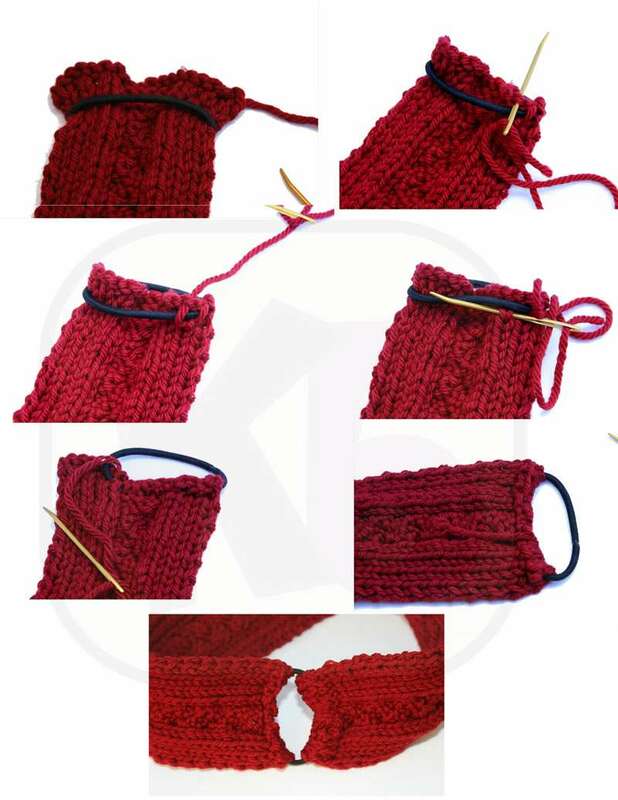 Bind off with basic bind off method. Leave a 16 inch yarn tail. Mattress stitch cast on edge to bind off edge. Weave ends in. Block lightly. 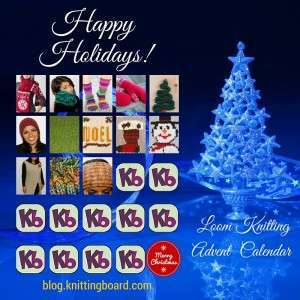 Matching Wristers will be posted on Loom Knitting Advent Day 15! Stay tuned! I have tried this pattern twice now & I don’t get the ridges that are shown in the pattern- what am I doing wrong/ Are the knit stitches perhaps not ewrap?? The knit stitches are a “knit stitch” not ewrap. You may substitute with a U-knit stitch. An ewrap will look different and it will create a larger item. Fall is here and the air is getting chilly. 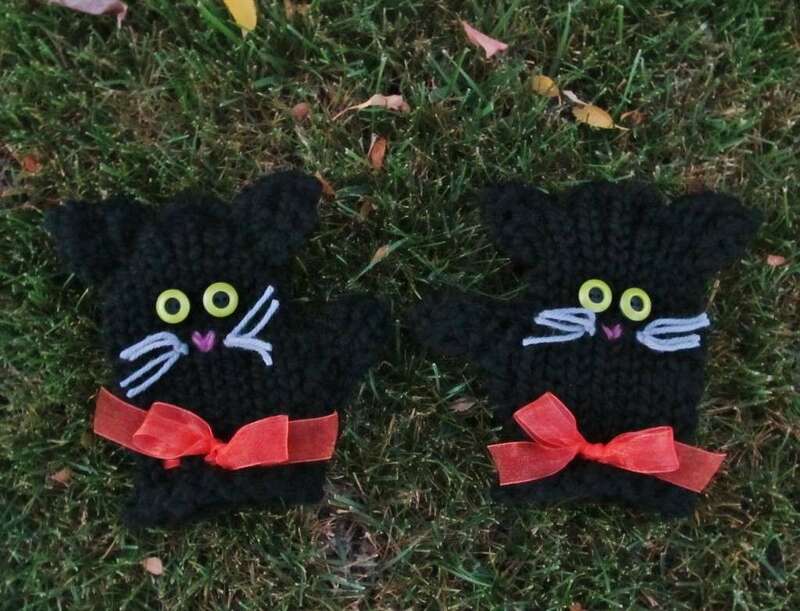 These adorable little mitts are a wonderfully fun way to keep a little pair of hands warm. Break out a pair of Kitty Mitts and watch the smiles come out to play. 7/8” wide sheer ribbon- 2 cuts, each measuring 25” in length, pink yarn or embroidery thread to stitch nose, gray yarn or embroidery thread to use for whiskers, and 4 green LaMode buttons (style # 34555). 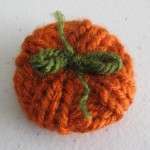 Finished Size: Approximately 7.5” in height by 4” in width. (Best suited for a child’s hands). 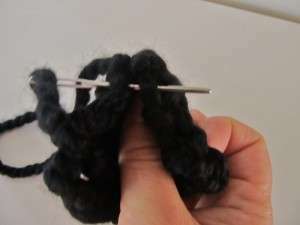 Flat Knit Stitch: Bring the working yarn in front of the peg to be worked, above the existing stitch on the peg, without bending the yarn around the peg. 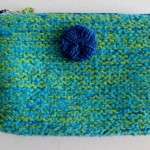 Knit the lower stitch over the working yarn. Basic Bind Off: Knit the first two pegs. Move the stitch from the second peg over to the first peg. 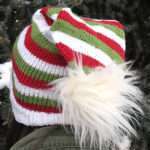 Knit the lower stitch over the upper stitch. One stitch has now been bound off. Move the stitch from peg 1 to the empty peg. This is now peg 1. Knit the next stitch. Move the stitch that was just knit over to the first peg. Knit the lower stitch over the upper stitch. Continue working in this manner until there is one stitch left. Cut the working yarn, leaving a yarn tail that is at least 4” long. Wrap the yarn tail around the last peg. 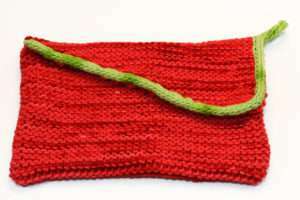 Knit the last stitch over the yarn tail and pull the yarn tail out through the stitch. Bind off is now complete. Gathered Bind Off: Loosely wrap the working yarn in a circle around all of the pegs that have stitches – two times. This will ensure that the yarn tail is long enough to complete the bind off. Cut the working yarn, then unwrap the long yarn tail from around the pegs. Lay the yarn tail below the stitch on peg 1. 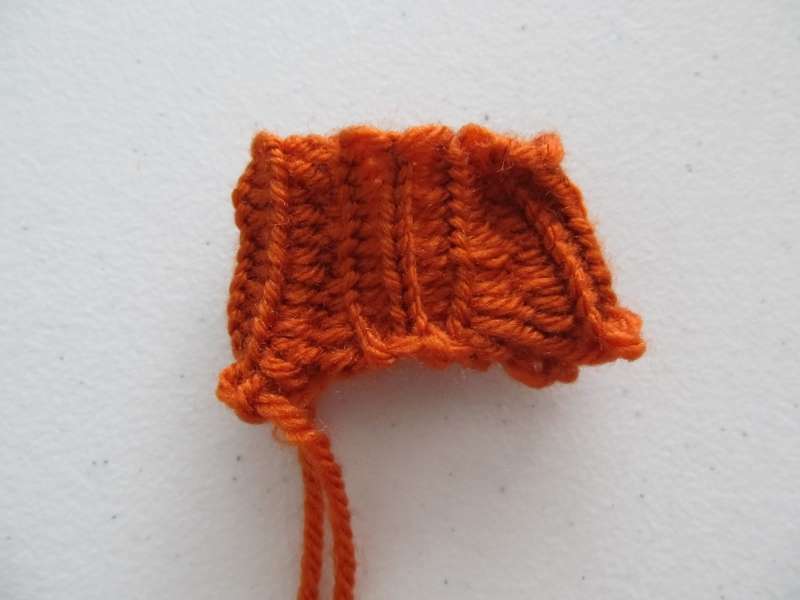 Using the knitting tool, pull the yarn tail up through the stitch. 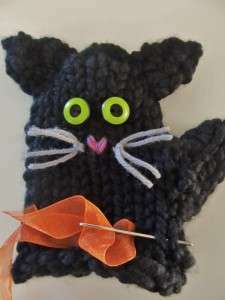 *Lay the yarn tail below the next stitch. 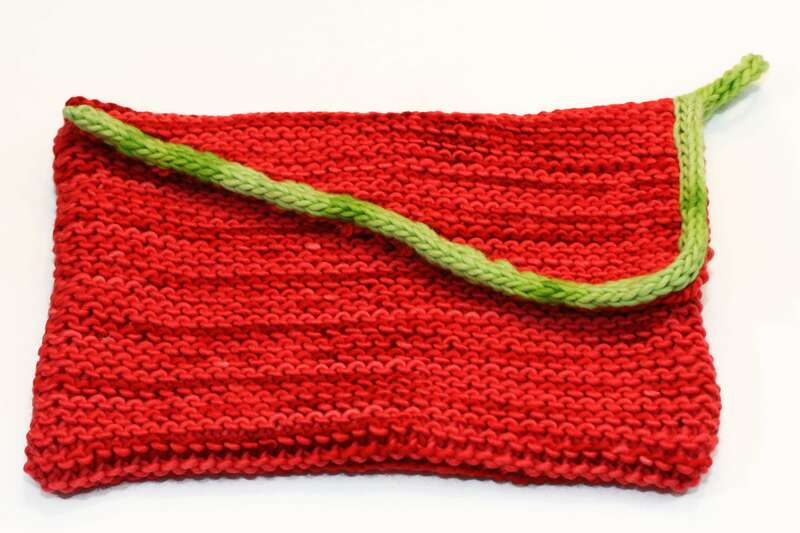 Using the knitting tool, pull the yarn tail up through the stitch. Repeat from * for all stitches on the loom. Once all stitches have been bound, remove the knitting from the loom. Pull on the yarn tail to cinch the opening closed (unless otherwise directed by the pattern being worked). Bind off is now complete. Leave a yarn tail measuring 18” long. Cast on 8 stitches. Knit 20 rows using the flat knit stitch. Bind off using the basic bind off method, leaving a 50” yarn tail. Note: The bind off end of each panel will be the cuff end of the mitts. Set panels aside for now. Cast on 6 stitches. 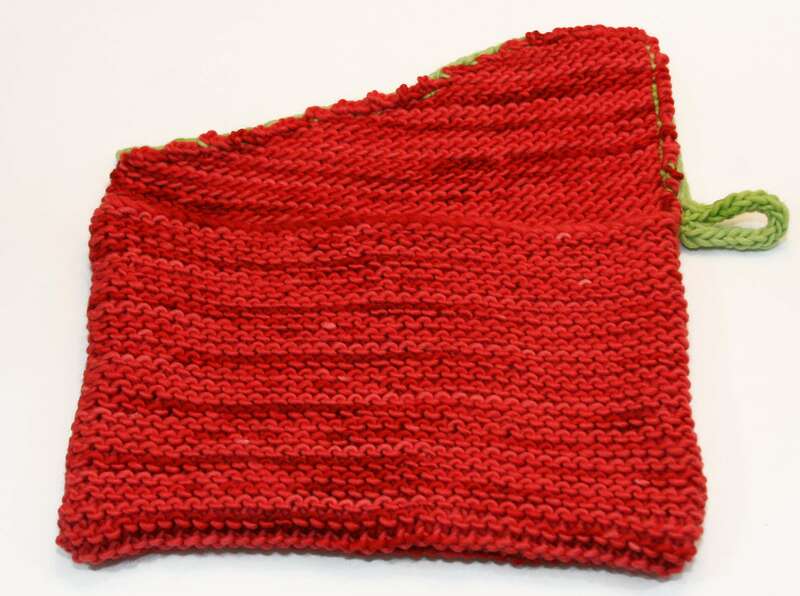 Knit 6 rows using the flat knit stitch. Cut the yarn, leaving a 14” yarn tail. Bind off using the gathered removal method. Seam the side of the thumb closed. Weave in both yarn tails and set aside for now. *Lay one panel on top of another, knit sides facing outward. Using the long yarn tail, seam the left side of the mitt closed. Whip stitch across the top of the mitt, being careful not to gather the top. Seam down the right side of the mitt, stopping after 3.5” of the side has been seamed closed. Weave in the yarn tail. Using the remaining long yarn tail at the bottom of the mitt, seam up the right side of the mitt, stopping after 2”. 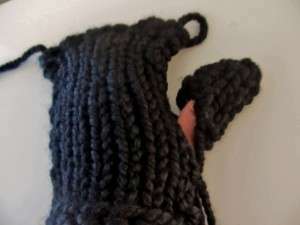 Using the same yarn tail, sew the thumb piece to the mitt, setting it into the opening on the right side of the mitt. Weave in the yarn tail. There should be 2 yarn tails left – one in each corner, at the top of the mitt. Using the tape measure, measure 2” in from the top left corner of the mitt. Stick a pin or needle in to mark this measurement. Thread the yarn tail at this corner into a yarn needle. Weave the yarn tail down through the inside of the mitt, bringing it back out near the lowest end of the pin or needle that is marking the 2” measurement. Sew in a diagonal line, just above the marking pin or needle, creating an ‘ear’. Make sure to pass all the way through the mitt, catching the top and bottom panel as you work. While working, keep the stitches tight. This will help to gather this area in a bit and create the desired shape. Repeat this process on the other side of the mitt, creating a second ‘ear’. Weave both of these yarn ends in. Set mitt aside for now. Repeat from * for the second mitt. With the pink yarn or embroidery thread, stitch a little v below the eyes for a ‘nose’. Do this for each mitt. Cut four lengths of gray yarn, each measuring 8” in length. Take two of the strands of gray yarn and tie them into a stitch on one side of the nose. (The yarn needle comes in handy here.) 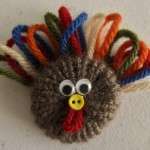 Take the remaining two strands of gray yarn and tie them into a stitch on the other side of the nose. Trim the whiskers to the desired length. Thread an end of the ribbon through the eye of the yarn needle. Using the yarn needle, weave the ribbon through the stitches around the cuff area of a mitt. Once the ribbon has been woven through the stitches all the way around the cuff of the mitt, tie the ends into a cute little bow. Repeat this process for the second mitt. Wishing you a warm and happy autumn! 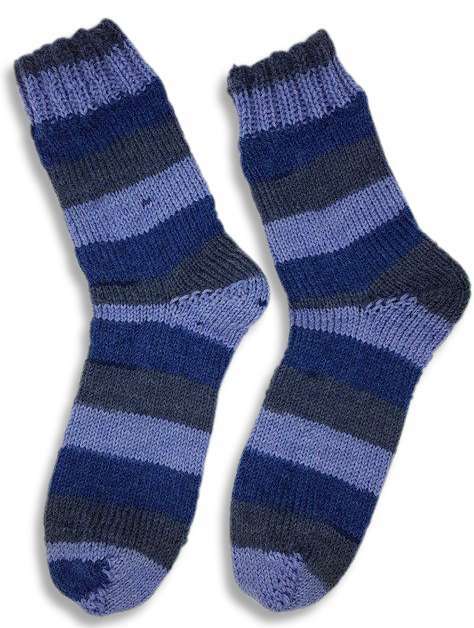 Knit up a pair of adorable baby leg warmers to keep the baby nice and warm during the springtime evenings. Knitting loom: Sock Loom 2. All-n-One knitting loom can also be used. Yarn: Baby Cables Leg Warmers: Approx 100 yds of worsted weight baby alpaca blend yarn. Sample was knit using Plymouth Yarn Baby Alpaca Brush. Color 2671 (light pink). 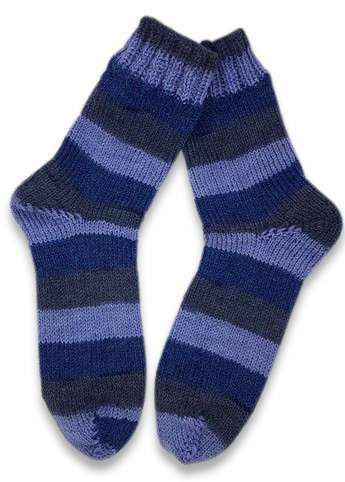 Slouchy Leg Warmers: Approx 100 yds of sports weight merino wool yarn. Sample was knit using Cascade Yarns 220 Superwash. Color 101 (pink blends). Notions: knitting tool, tapestry needle, cable needle (or a stitch holder). Gauge: 20 sts x 24 rows= 4 inches in stockinette. 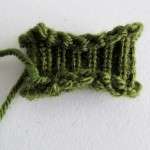 K=Knit stitch (May substitute with the flat stitch or the u-stitch). Sample was worked with the U-stitch. Step 1: Take working yarn behind peg 1 (skipping peg 1). Step 2: Knit peg 2; remove loop and place stitch on cable needle and hold it to the center of the loom. Step 3: Move stitch from peg 1 to peg 2 (leaving peg 1 empty). Step 4: Place stitch from cable needle on peg 1. Step 5: Knit peg 2. 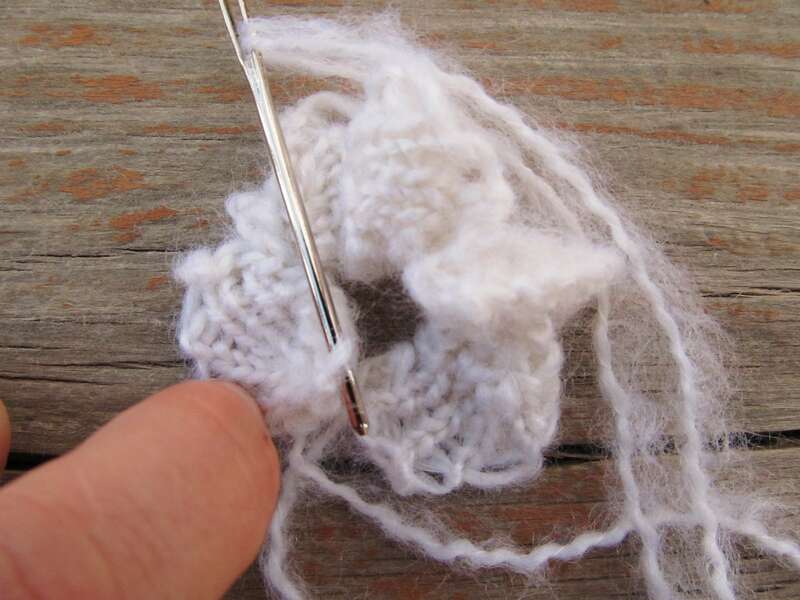 Pattern notes: It is imperative to use a loose cast on method such as the ewrap cast on. Also, recommend to bind off loosely. Cast on 32 sts, prepare to work in the round. Rnd 1-6: *k2, p2; rep from * to end of rnd. Rnd 7: *LT, p2; rep from * to end of rnd. Rnd 8: *k2, p2; rep from * to end of rnd. Rep Rnds 5-8: 8 more times (or until desired length). Next 5 rnds: *k2, p2; rep from * to end of rnd. Bind off loosely with open removal method. Weave ends in. Block lightly. Rnd 1-10: *k2, p2; rep from * to end of rnd. Next 6 rnds: k to the end of rnd. Next 4 rnds: p to the end of rnd. Rep last 10 rnds: 4 more times (or until desired length). Next 10 rnds: *k2, p2; rep from * to end of rnd. 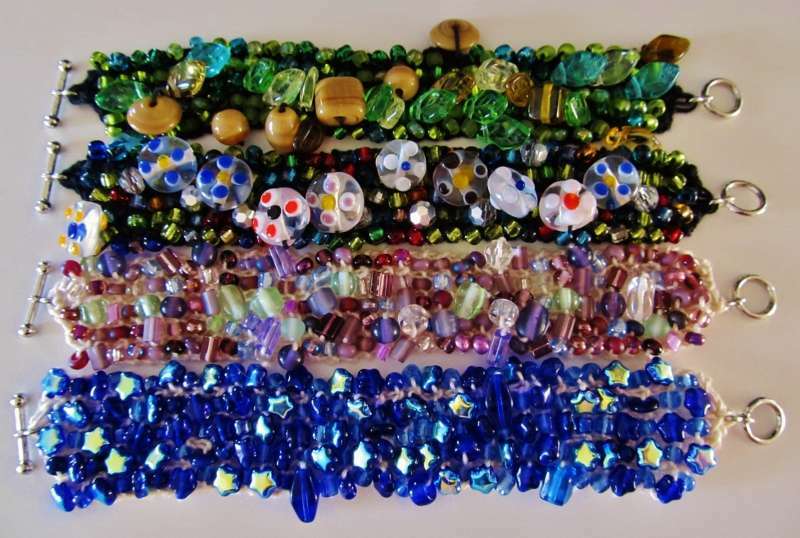 Gather a variety of colorful beads, cotton thread, and a few toggle clasp sets; then have a marvelous time creating an assortment of beautiful, unique bracelets. Yarn: Approximately 6.5 yards of a size 10 thread weight cotton yarn. 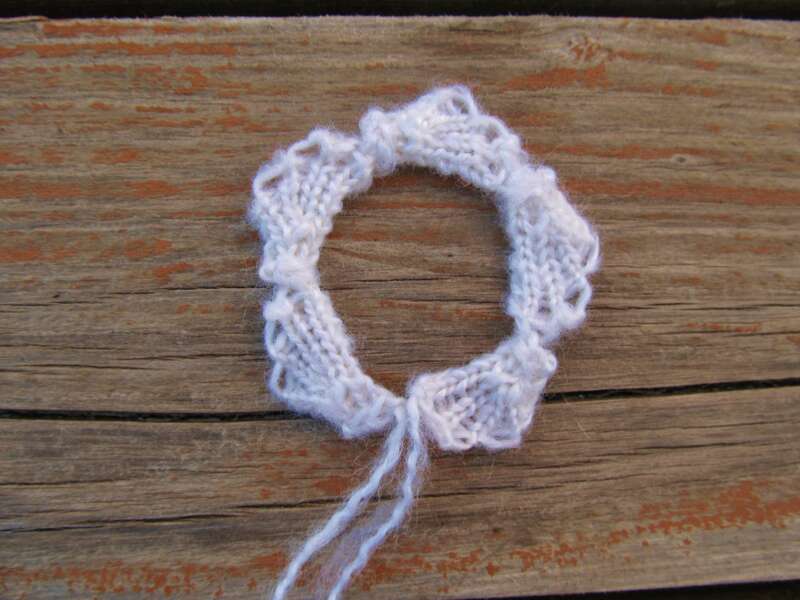 Aunt Lydia’s Classic Crochet Thread was used in the samples. Beads: at least 160 beads in a variety of sizes, shapes, and colors. 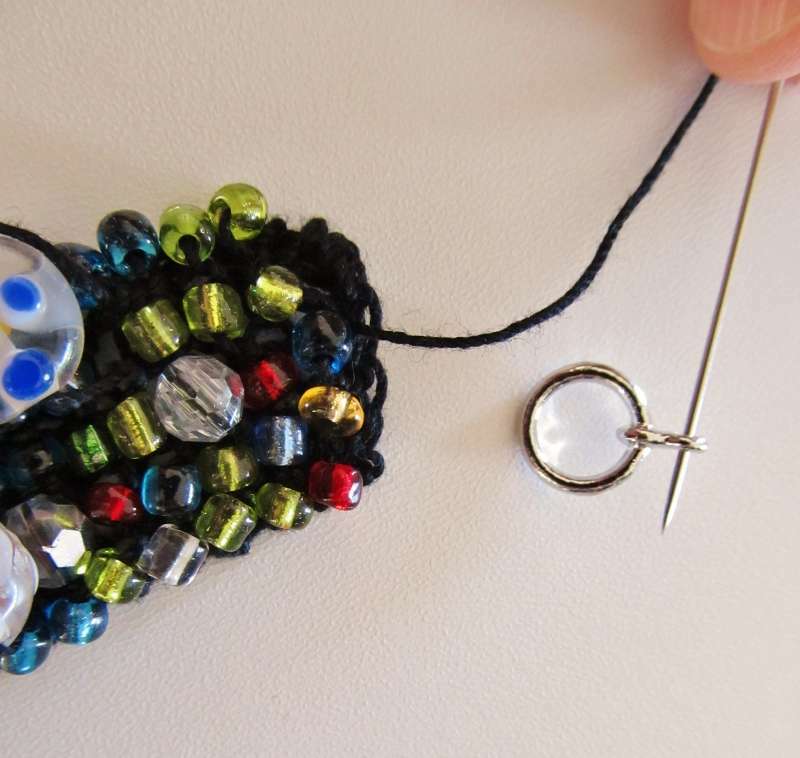 Choose beads with an opening that will easily slide onto the cotton thread. The smallest beads used in the samples were size 6/0. The largest measure about ½” in diameter. Notions: Knitting tool, scissors, needle, a toggle/clasp set for each bracelet, superglue. Gauge: 2 pattern repeats (4 rows) = approximately ¼” in length. 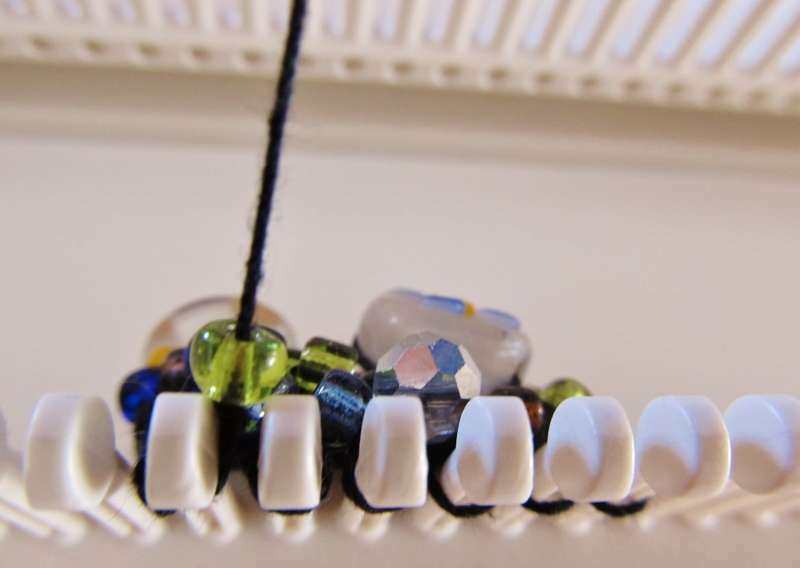 Placing Beads: To place a bead, slide the bead along the working yarn until it reaches the pegs. 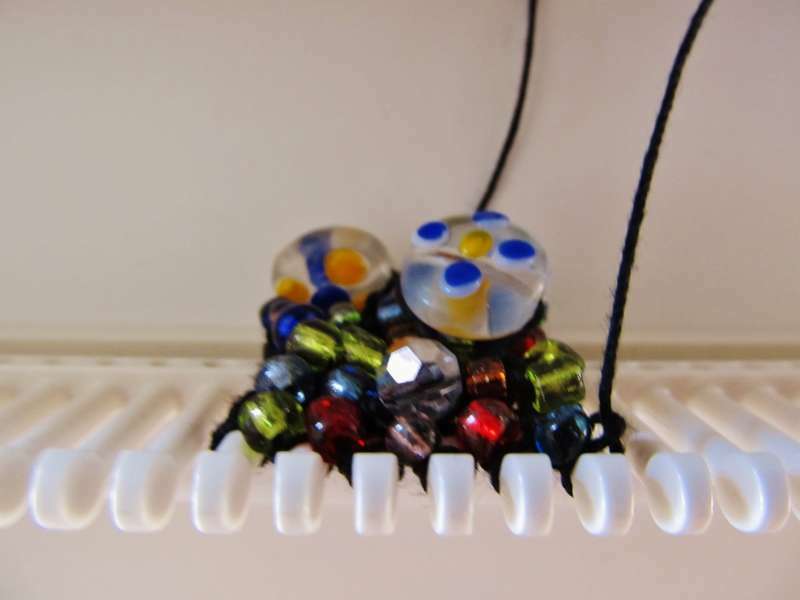 For this project, the beads will always be placed behind the pegs, between the peg most recently worked and the next peg to be worked. 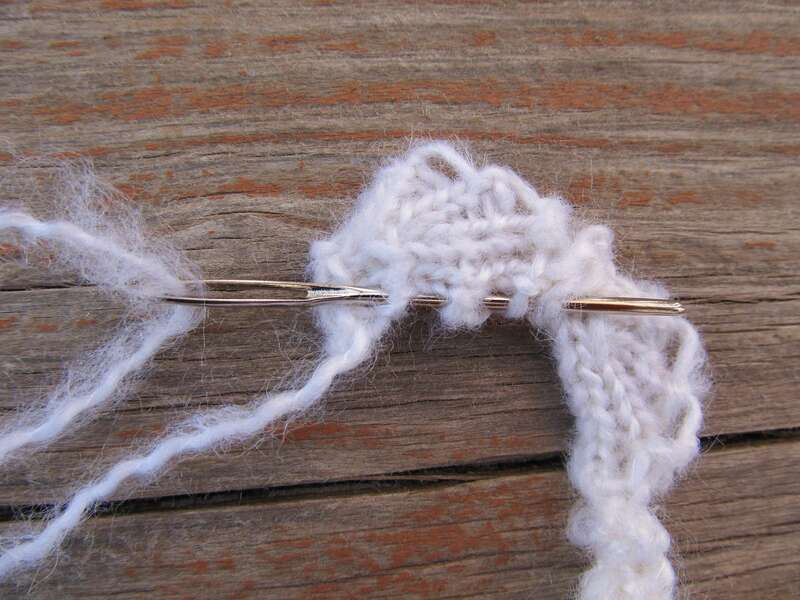 Once the bead is in place, bring the working yarn around to the front of the next peg to be worked and complete the stitch, locking the bead in place. Larger beads are added in the same manner as smaller beads. There will be a little extra thread used when adding larger beads. This is accounted for in the amount listed in the materials. 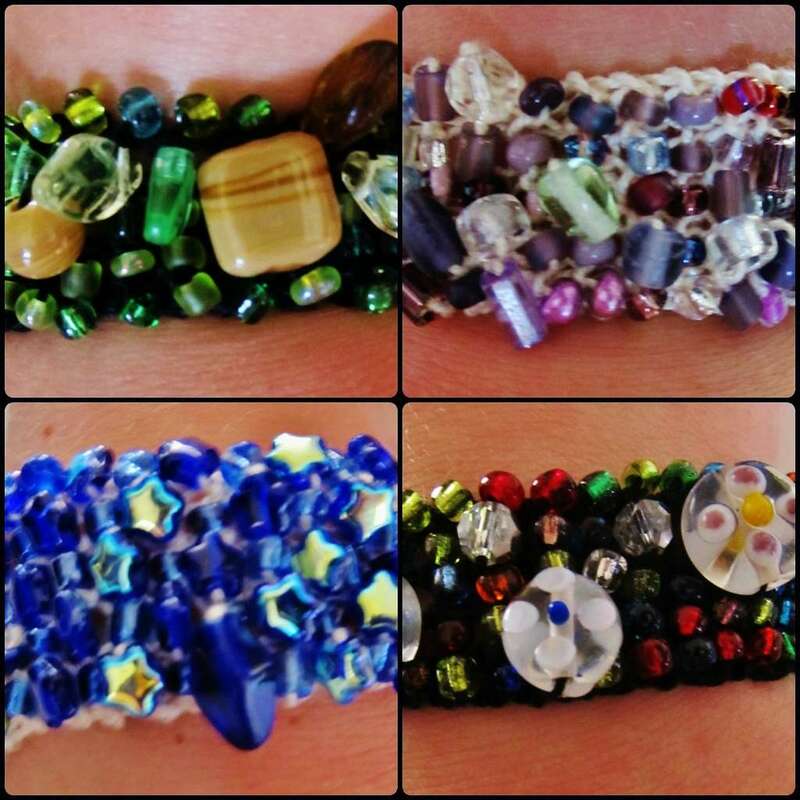 The larger beads also take up a bit more space, but they do fit and the added variety makes the bracelet more interesting. Take one end of the cotton thread and dip about 1” of it into the glue, then allow it to dry. Using the stiffened end, string 160 beads onto the cotton thread. Leaving a 5” tail, cast on 6 stitches using the double e-wrap method. Row 2: K1, [place bead, K1] 5 times. Repeat Rows 2 and 3 until all the beads have been placed. Bind off using the basic bind off method. Leave a 5” tail when cutting the thread after bind off. Thread the needle with one of the thread ends. Whip stitch along the end of the bracelet, until the thread is at the center of the end. Sew through the connecting loop of the toggle, then sew through the end of the bracelet. Sew through the connecting loop again and into the end of the bracelet again. Sew through once more, then continue to whip stitch along the end of the bracelet. Weave the thread end in on the back of the bead work. Repeat this process to sew the clasp to the other end of the bracelet. A friend of mine recently asked for a pattern similar to this, I remembered that I had created one years ago, so I went digging for it. I hope you can find it useful. There are those days when one wishes one can just go out without a wallet or a purse. Actually, I am not a purse person at all. I hate them, they are bothersome to have around and then if you go to a restaurant you have to watch where you put it or find a place to put it. The wrister wallet comes very handy in those occassions. I also see it being useful as my children grow up, a great way for them to carry a little cash with them. 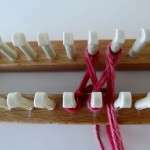 Knitting loom: All-n-One loom suggested or 22 pegs small gauge loom. 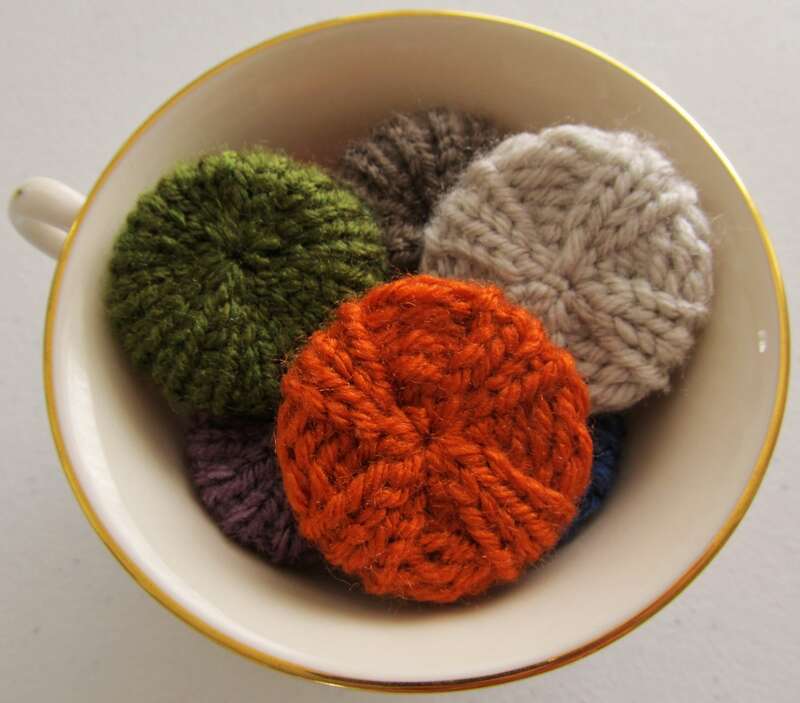 Yarn: Bits of worsted weight yarn. Notions: knitting tool, tapestry needle, sewing needle and thread in color of choice. Size: The sample fits a wrist that is approximately 5.5 inches in circumference. The little pocket is about 1.5 inches in width. k2tog=knit two stitches together. Move the loop from the peg on the right to the peg on the left, this leaves an empty peg and one peg with 2 loops, treat the 2 loops as one loop when knitting the row. yo=yarn over. ewrap the empty peg. BO=Bind off. This pattern uses the basic bind off. Pattern notes: worked as a flat panel. The picture differs slightly from the pattern below. After I finished knitting it, I realized that I should have purled the row where the little pocket ended so that it would sit more flat, my picture doesn’t have that purl row (it is row 17 of the pattern). Assembly: using yarn and tapestry needle close the pocket by folding it along the purl row, sew it on the wrong side of the small panel. Also close the bottom edge. With thread and needle place the little buttons in place, follow the picture for layout. This is awesome, will make a wonderful Christmas gift, would be great for the gym. I see myself knitting some for x-mas. Thank you so much for sharing, I love it. 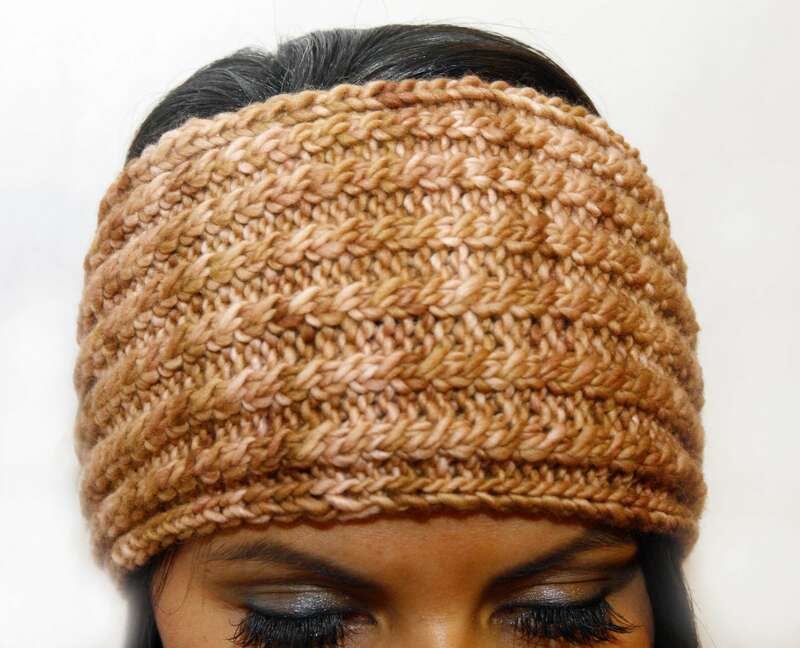 The Aislin Earwarmer is a luscious blend of a perfect braid cable with spongy ribbing. The use of merino wool lends this earwarmer a dreamy feel that provides just the perfect amount of warmth to keep the chill away. The earwarmer uses an elastic hairband to provide a comfortable fit. SIDE NOTE: It is all about cables . I love cables, every knit should have cables. My favorite sweater that I saw my grandma knit was red and it had cables. She is the type of woman that could picture something and make it. She made that red sweater with no pattern at all, just from her head. 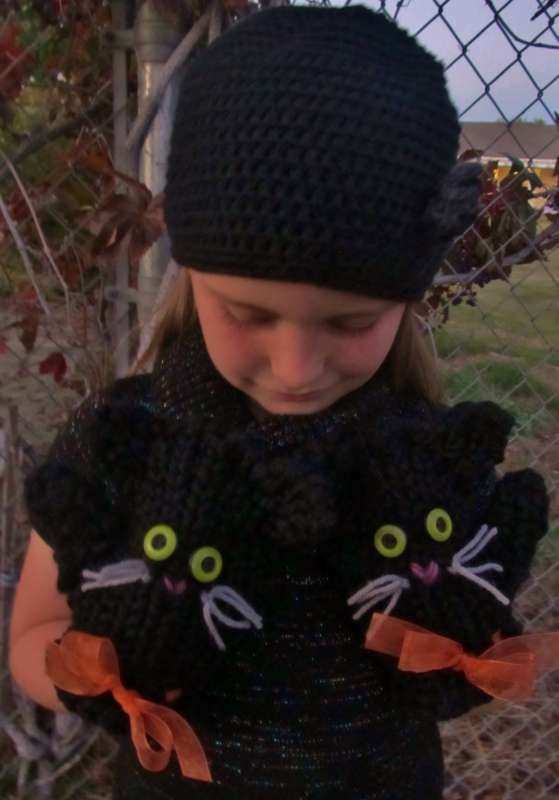 People would travel from neighboring towns to buy her knits and her crochet items. To this day, I love cables, especially when they are knit with red yarn. I think it reminds me of her and the time I spent learning by her side. I owe everything I am today to my Grandma. My talents come from her, she saw something in me that I didn’t see and thank goodness she was patient enough to teach me. I would like to express my gratitude to Dayna Scoles, who dreamed the idea of using an elastic hairband to make the headbands adjustable. Check out her neat patterns and the unique way she uses the hairbands on double knit headbands. Knitting loom: Adjustable Hat Loom, set at large gauge, 20 pegs. Yarn: Approx 60 yards of superwash merino wool in Aran weight. Cascade 220 Aran weight in Ruby was used in sample. Notions: knitting tool, tapestry needle, cable needle. Size: 3 x 19 inches, blocked. C4F: Cable over 4 stitches, cable leans to the left. 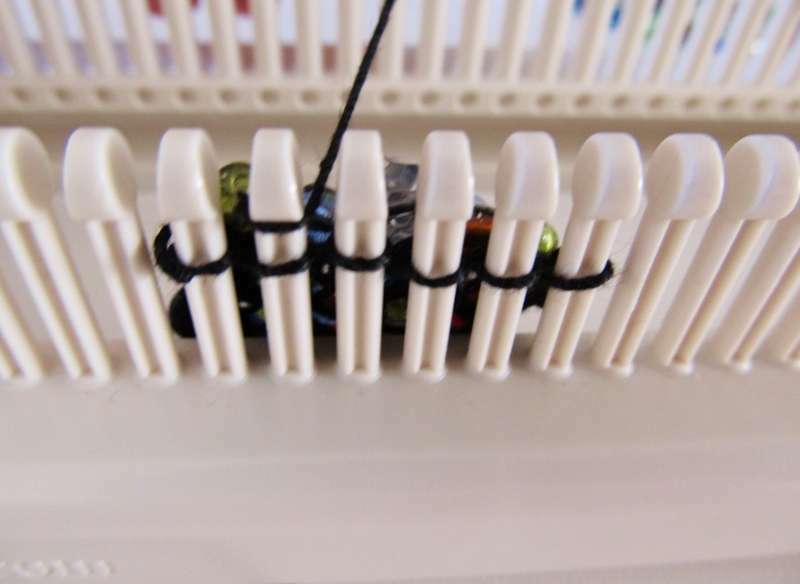 How to: Skip peg 1 and 2 with yarn towards the back of the pegs. Knit peg 3 and 4. Place stitches from pegs 3 and 4 on cable needle. Take yarn to the front of peg 1. Knit peg 1. Knit peg 2. Place stitch from peg 2 on peg 4. Place stitch from peg 1 on peg 3. Place stitches from cable needle on pegs 1 and 2. C4B: Cable over 4 stitches, leans to the right. 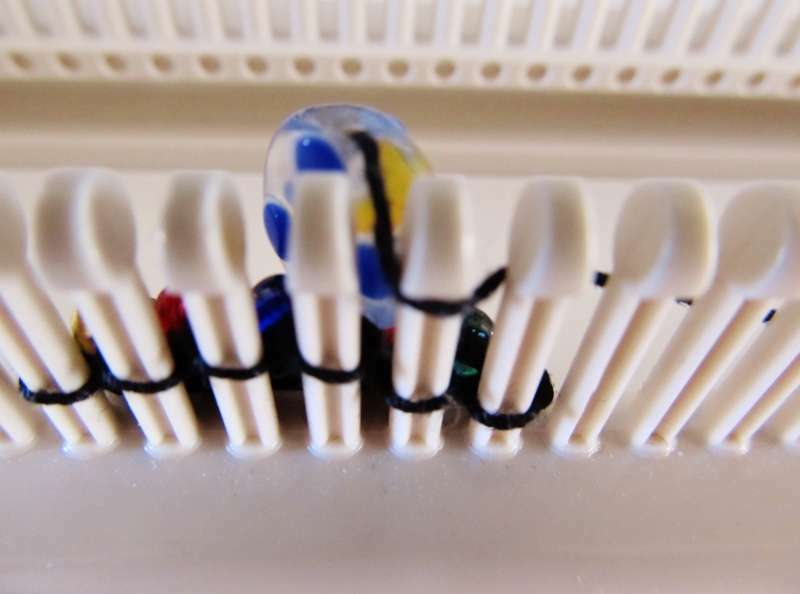 How to: Place stitches from peg 1 and 2 on cable needle and hold to the back of the pegs. Knit peg 3 and 4. Place stitch from peg 3 on peg 1; place stitch from peg 4 on peg 2. Place stitches from cable needle on pegs 3 and 4. Knit pegs 3 and 4. Leave a 10-inch beginning yarn tail, cast on 20 sts, prepare to work a flat panel. Row 1-4: [k1, p1]2x, k1, p2, k6, p2, [k1, p1]2x, k1. *Row 5: [k1, p1]2x, k1, p2, k2, c4f, p2, [k1, p1]2x, k1. Row 6: [k1, p1]2x, k1, p2, k6, p2, [k1, p1]2x, k1. Row 7: [k1, p1]2x, k1, p2, c4b, k2, p2, [k1, p1]2x, k1. Repeat Rows from * to *: 27 more times. Next 3 rows: [k1, p1]2x, k1, p2, k6, p2, [k1, p1]2x, k1. Bind off with basic bind off method. Leave a 10-inch yarn tail. Tighten the cables from the wrong side of the item. Add the hair band: pass the hair band through one of the ends of the headband. Fold the end of the headband as to cover the hairband, whip stitch the bound off edge to the wrong side of the headband to secure the hairband in place. Repeat with the other side of the headband. Use the pictures below to see how I sewed the elastic hairband in place. PS: You can also put your hair in a pony tail and pass the pony through the opening created by the elastic hairband! Bonus!!! Like you, I love anything Cable. I know I will be making this for my daughter-in-law who lives in Germany. Thanks so much for a really great pattern and sharing with all of us. Oh what a good idea! Something I was just thinking about too. Can this be made on an All-N-One? Or on a Knifty Knitter or 10″ Knitting Board? I don’t have a hat loom, but these will make fantastic gifts. With worsted weight yarn, yes. The headband would also end up a lot thinner than the photo shown. These charming miniature knitted poufs just might become an obsession, especially since there are two styles to choose from! This scrap happy project will help you use up all of those lonely little remnants that are lurking about in your yarn collection. So much fun to make – and even more fun deciding how to use all of the wonderful, colorful little poufs! 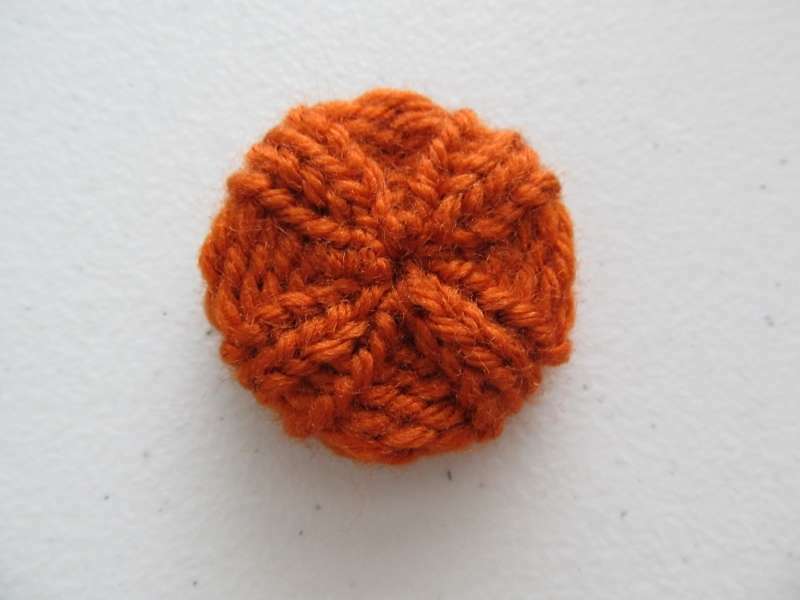 Yarn: Approximately 5 yards of a basic worsted weight yarn per pouf. Vanna’s Choice by Lion Brand was used in the samples. Drawstring Cast-On: Step 1: Pass the working yarn in front of peg 1. Pass the working yarn behind peg 2. Pass the working yarn in front of peg 3. Pass the working yarn behind peg 4. 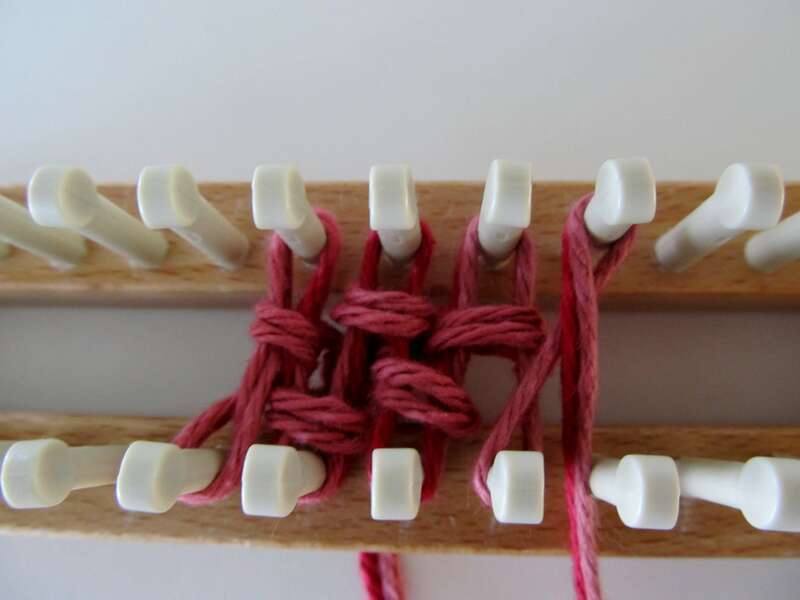 Continue weaving the working yarn in front of and behind the pegs until the working yarn reaches peg 1 again. Step 2: Lay the working yarn against peg 1, above the wrap from step 1. Knit the lower wrap over the top wrap. Pass the working yarn in front of peg 2. Lay the working yarn against peg 3, above the wrap from step 1. Knit the lower wrap over the top wrap. Pass the working yarn in front of peg 4. Continue working in this manner until the working yarn reaches peg 1 again. Cast-on is now complete. Continue on as directed in the pattern. Textured Pouf: Prepare the loom to work over 16 pegs, in the round. 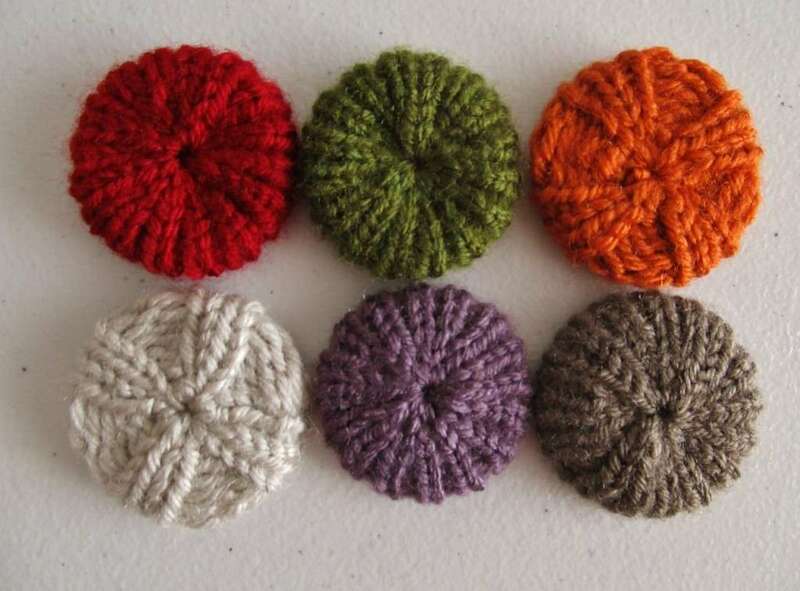 Choose a yarn color for the pouf. Using the drawstring cast on method, cast on 16 stitches. Work 12 rows in ribbing stitch: *K2, P2, repeat from * to end of round. 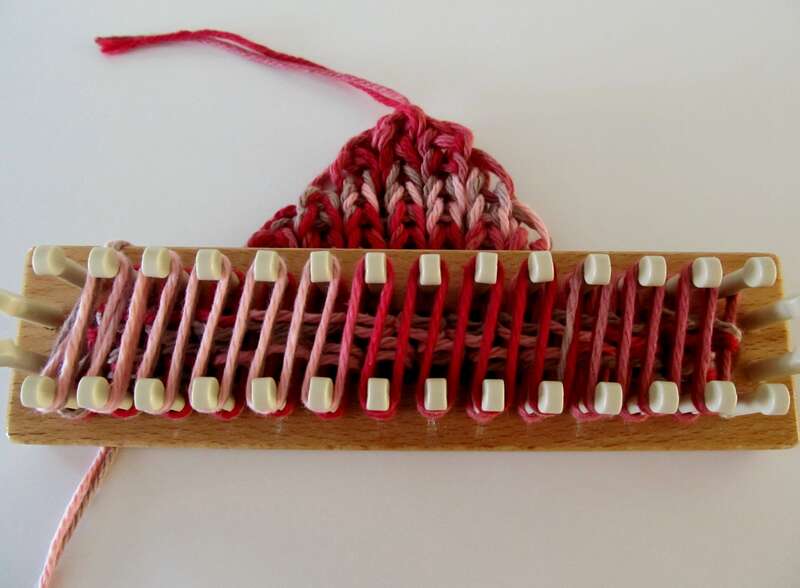 Remove from the loom using the gathered bind off method. Now for the best part – deciding what to do with all of those darling little poufs! These are Supper Cute ! Put a button in the middle and sew one to a hat. Those are just way too cute! Thanks for sharing. Reminds me of crocheted “puffs” that you use to do and sew or crochet together to make afghans or vests,etc. how adorable! Imagination can go wild on this cute “poufs”! Thanks for the pattern. Thank you for your comments, Denise, Barb, and Sue. Hello! My name is Jenny Stark. 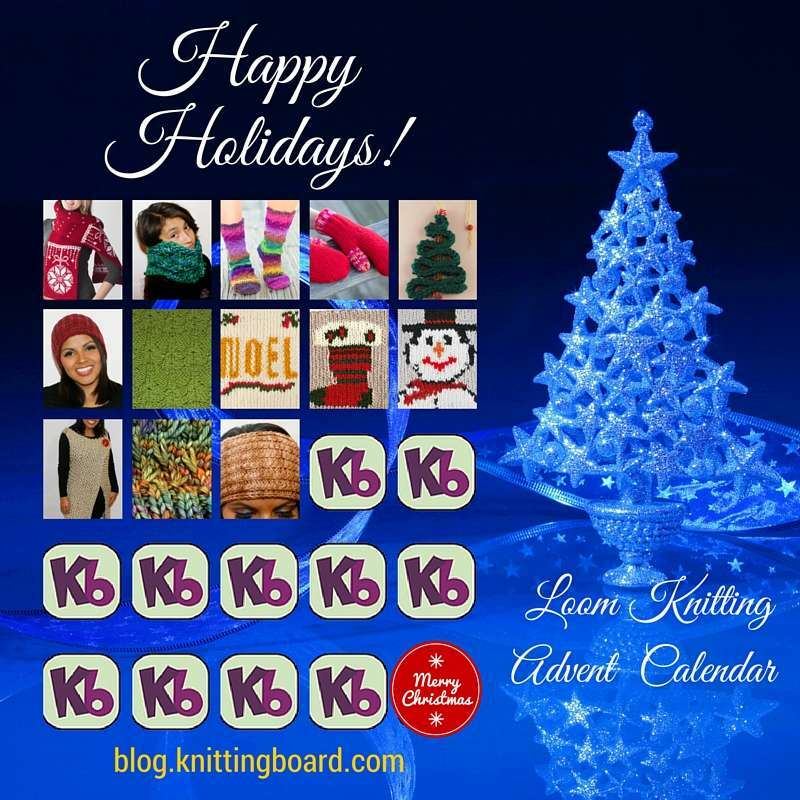 I am so excited to be joining you here at Knitting Board Chat! 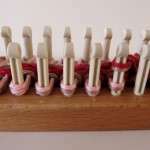 Once a month, I will be sharing a whimsical little project that you can make with your KB looms. These projects will be fast and fun – perfect for squeezing in to your busy schedule. After all, you know what they say about all work and no play… So, let’s chase those doldrums away with a little bit of yarn! This darling little flower is a great way to use up little bits of yarn left over from other projects. 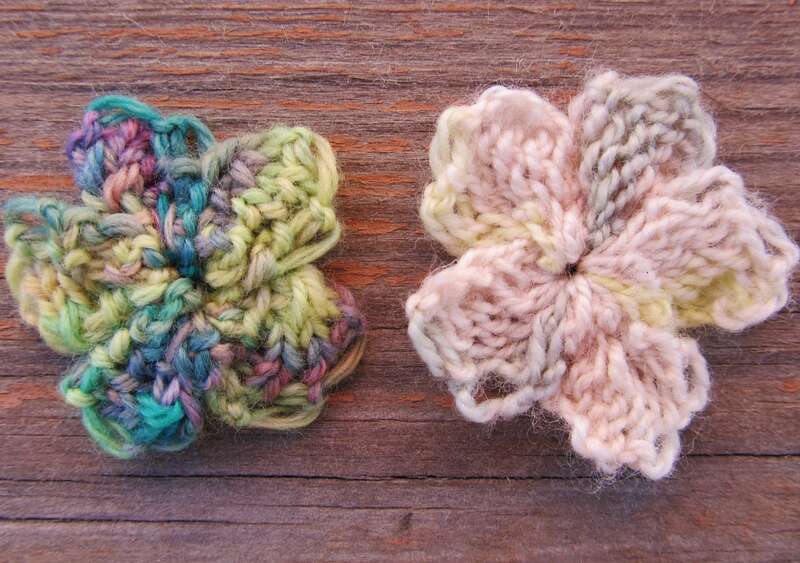 Make a handful of flowers and use them to embellish hats, bags, hair clips, cards, etc. Yarn: Approximately 5 yards of a #4 yarn. 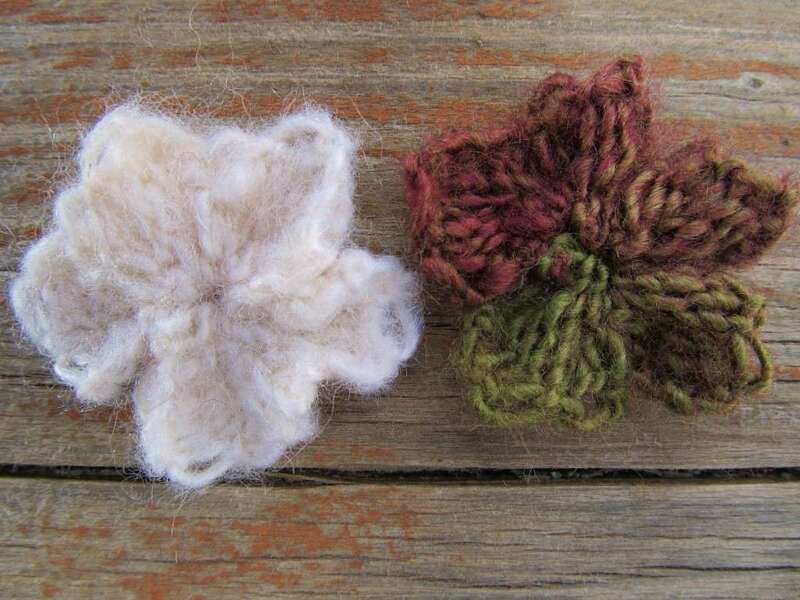 Each layer of this flower uses about 2.5 yards of yarn. Work it all in one color, or use two different colors for variety. Samples use various yarns, including Mosaic by Bernat, Boutique Unforgettable by Red Heart, and Sheep(ish) by Caron. Notions: Knitting tool, scissors, yarn needle, button, needle and thread. 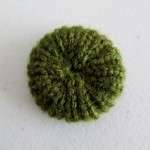 Size: About 2″ in diameter. Knit peg 2, twelve times. *Cast a new stitch on to peg 2. Repeat from * until there are six petals total. Bind off: Cut yarn, leaving a 5″ yarn tail. Knit the last stitch and pull the yarn tail out through the last stitch. Gently pull on the yarn tail to tighten the bind off. Turn it over, and straighten it out. Set the first flower aside and make the second flower. Finishing: Stack one flower on top of the other. 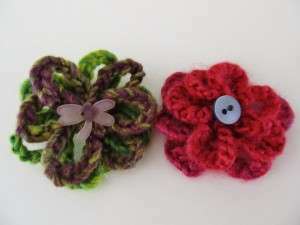 Use the yarn tails to sew the top flower to the bottom flower. Weave in all ends. Now – go and make a handful of flowers! Happy embellishing! That makes a very sweet flower. Thanks for sharing your creativity. Thanks to each of you for your kind comments. Have a great day! can i please see a pic of the lomm used too make these and where can i buy it? Two stylish headbands to keep your hair in place while you are out and about enjoying the summer. 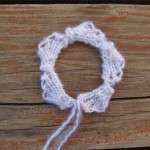 The first one is the Anchor’s Away Headband, a great beginner lace project. It introduces the basics of moving stitches to different pegs to create eyelets that give lace its open effect. 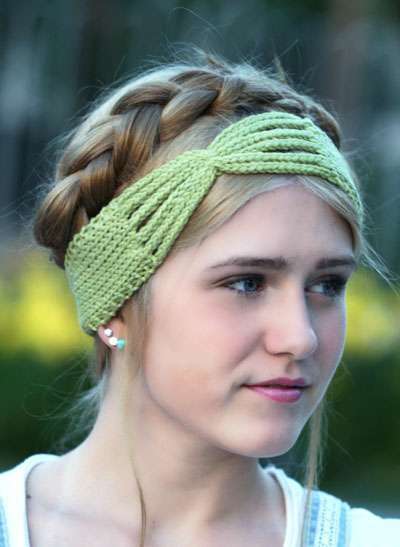 The Lulu Headband is a fantastic, quick project that will add a touch of intricacy without its complications. 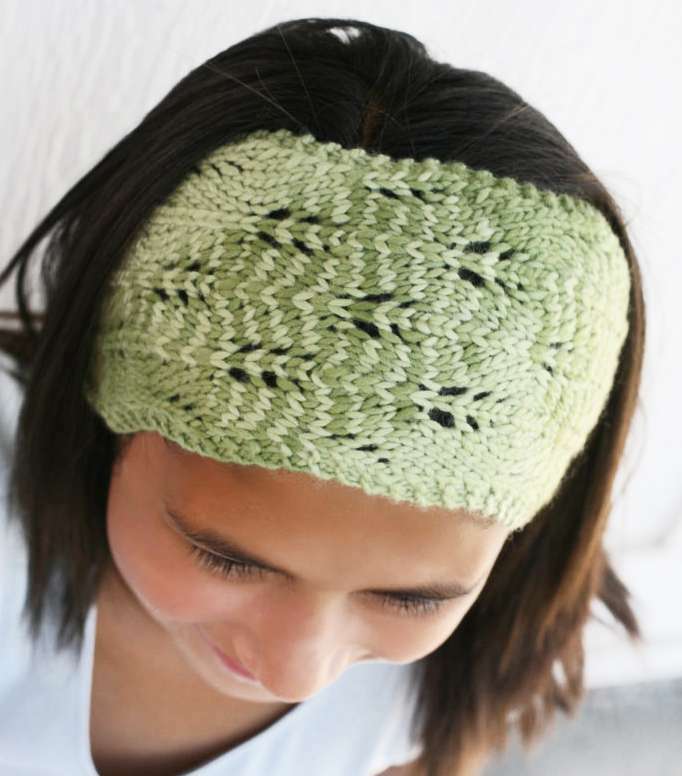 A lovely headband that will introduce you to beginning lace. 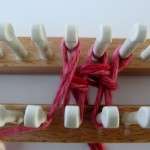 Knitting Loom: Sock Loom 2, 19 pegs used. Yarn: Approx 70 yds of worsted weight yarn cotton. Sample used Knit Picks Swish Worsted in Amythest Heather. Notions: knitting tool, tapestry needle, 2 double pointed needles size US 5, crochet hook size H.
K2tog=knit two stitches together. Move stitch from the peg on the left to the peg on the right. Work/knit both loops as one loop. YO=Yarn over. Ewrap peg on the row that calls to YO, on the next row when you need to knit the stitch, undo the ewrap and lay the yarn flat in front of the peg. 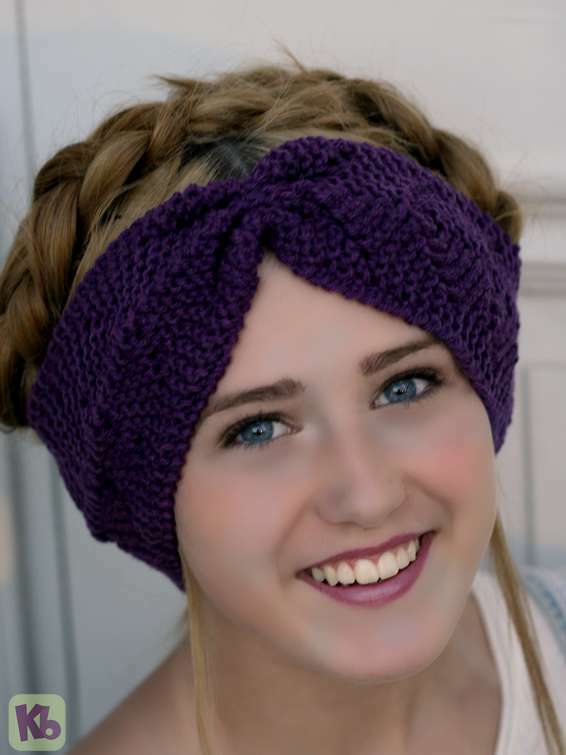 Pattern note: Headband is worked in two parts, half and half, then joined at the center. Leave a 20 inch beginning yarn tail to use for the button loop. Cast on 19 sts, work a flat panel. Row 1: sl1, k to the end of row. Row 2: sl1, p to the end of row. Row 3: sl1, k to the end of row. Row 4: sl1, p to the end of row. *Row 5: sl1, k2, yo, k5, CDD, k5, yo, k3. How to: Move stitch from peg 9 to peg 10. Move stitch from peg 11 to peg 10. Three stitches are on peg 10. Move stitch from peg 8 to 9, from peg 7 to 8, from peg 6 to 7, from peg 5 to 6, from peg 4 to 5. Move stitch from peg 12 to 11, from peg 13 to 12, from peg 14 to 13, from peg 15 to 14, from peg 16 to 15. Pegs 4 and 16 are empty. Now that the stitches have been moved, you are ready to work the row as instructed. Row 6: sl1, p to the end of the row. Row 7: sl1, k3, yo, k4, CDD, k4, yo, k4. How to: Move stitch from peg 9 to peg 10. Move stitch from peg 11 to peg 10. Three stitches are on peg 10. Move stitch from peg 8 to 9, from peg 7 to 8, from peg 6 to 7, from peg 5 to 6. Move stitch from peg 12 to 11, from peg 13 to 12, from peg 14 to 13, from peg 15 to 14. Pegs 5 and 15 are empty. Now that the stitches have been moved, you are ready to work the row as instructed. Row 8: sl1, p to the end of the row. Row 9: sl1, k4, yo, k3, CDD, k3, yo, k5. How to: Move stitch from peg 9 to peg 10. Move stitch from peg 11 to peg 10. Three stitches are on peg 10. Move stitch from peg 8 to 9, from peg 7 to 8, from peg 6 to 7. Move stitch from peg 12 to 11, from peg 13 to 12, from peg 14 to 13. Pegs 6 and 14 are empty. Now that the stitches have been moved, you are ready to work the row as instructed. Row 10: sl1, p to the end of the row. Row 11: sl1, k5, yo, k2, CDD, k2, yo, k6. How to: Move stitch from peg 9 to peg 10. Move stitch from peg 11 to peg 10. Three stitches are on peg 10. 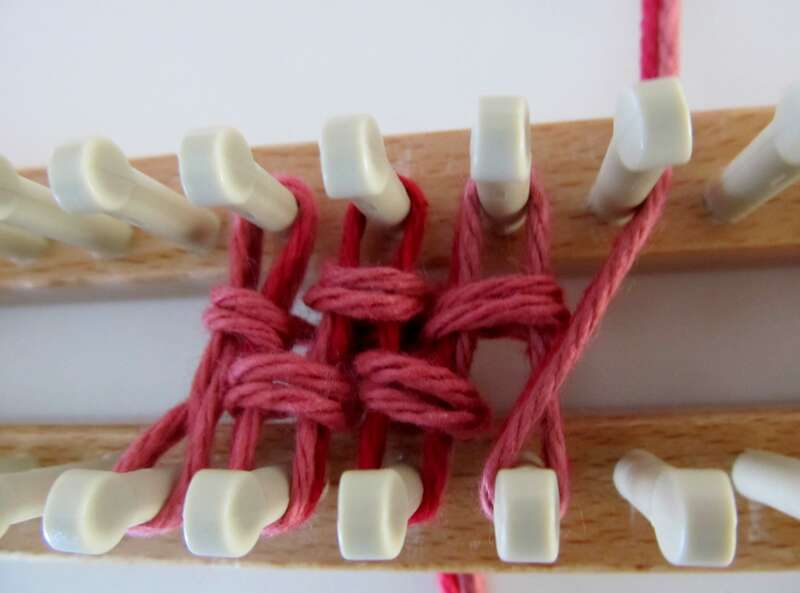 Move stitch from peg 8 to 9, from peg 7 to 8. 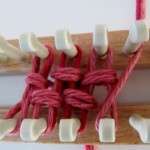 Move stitch from peg 12 to 11, from peg 13 to 12. Pegs 7 and 13 are empty. Now that the stitches have been moved, you are ready to work the row as instructed. Row 12: sl1, p to the end of the row. Row 13: sl1, k6, yo, k1, CDD, k1, yo, k7. How to: Move stitch from peg 9 to peg 10. Move stitch from peg 11 to peg 10. Three stitches are on peg 10. Move stitch from peg 8 to 9. Move stitch from peg 12 to 11. Pegs 8 and 12 are empty. Now that the stitches have been moved, you are ready to work the row as instructed. Row 14: sl1, p to the end of the row. Row 15: sl1, k7, yo, CDD, yo, k8. How to: Move stitch from peg 9 to peg 10. Move stitch from peg 11 to peg 10. Three stitches are on peg 10. Pegs 9 and 11 are empty. Now that the stitches have been moved, you are ready to work the row as instructed. Place these 19 sts onto one of the double pointed needles, cut yarn leaving a 20 inch yarn tail. 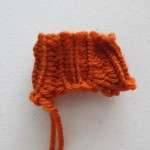 Once both halves of the headband are completed, use the kitchener stitch to join both sides together at the center. Option: If you prefer not to do a kitchener stitch, bind off the 19 stitches after completing each half. Once completed, use the mattress stitch to join both halves together. Thread tapestry needle with yarn, at the center point where the two halves were joined, gather it into three small folds, using the tapestry needle, sew the pleat down. 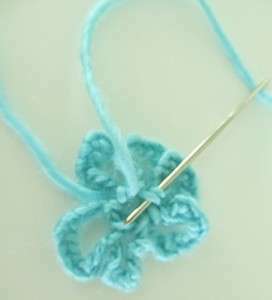 Button loop-using crochet hook and one of the beginning yarn tails, single crochet along the triangle until you reach the pointed edge, chain 4 at the point to create the button loop, then continue single crochet along to the end of the triangle point. Button—on the opposite side, at the point, secure a small decorative button. Block to open up the eyelets in the lace. 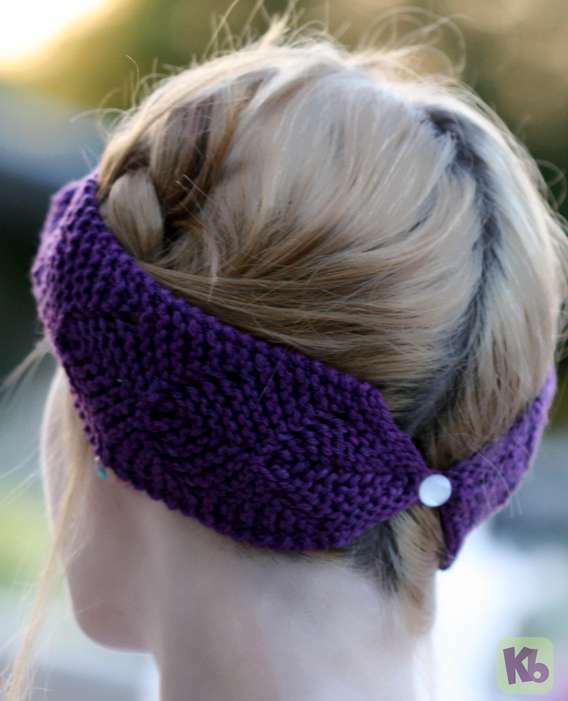 A lovely and easy headband that displays a center gathered with icords. 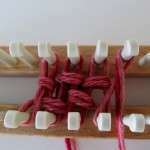 Knitting Loom: Sock Loom 2, 12 pegs used. Yarn: Approx 60 yds of worsted weight yarn cotton. 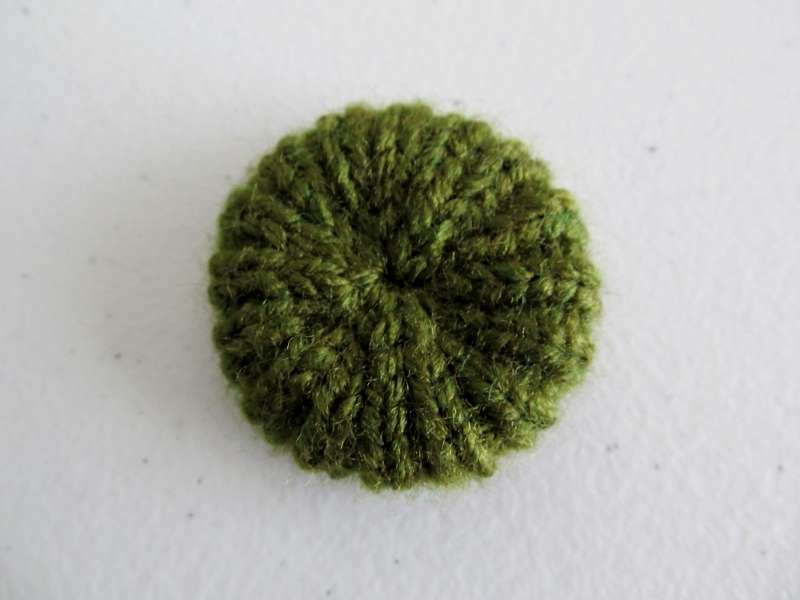 Sample used Knit Picks Swish Worsted in Green Tea Heather. Notions: knitting tool, tapestry needle, crochet hook size H.
Cast on 12 sts, prepare to work a flat panel. Row 5: sl1, k to the end of the row. Row 6: sl1, p1, k8, p2. Rep Rows 5 and 6: until you reach Row 60. From this point on, we will be working on two pegs at a time to create the icords for the center. Icord 1: Over the first two pegs (pegs 1 and 2), work a 2 st icord that is 35 rows long. Cut yarn and join yarn at peg 3. Icord 2: Work a 2 st icord over peg 3 and 4 that is 35 rows long. Cut yarn and join yarn at peg 5. Icord 3: Work a 2 st icord over peg 5 and 6 that is 35 rows long. Cut yarn and join yarn at peg 7. Icord 4: Work a 2 st icord over peg 7 and 8 that is 35 rows long. Cut yarn and join yarn at peg 9. Icord 5: Work a 2 st icord over peg 9 and 10 that is 35 rows long. Cut yarn and join yarn at peg 11. Icord 6: Work a 2 st icord over peg 11 and 12 that is 35 rows long. Cut yarn and join yarn at peg 1. With yarn back at peg 1, we are ready to begin working over all 12 sts again. Next row (over all 12 pegs): sl1, k to the end of the row. Rep last two rows 25 more times (a total of 52 rows). Next row: sl1, k to the end of the row. Next row: sl1, p to the end of the row. Bind off with basic bind off method. Leave a 20 inch yarn tail for the button loops. Using the crochet hook and the yarn tail from the BO edge, single crochet 3sts, work 4 chains, single crochet 2 sts, work 4 chains, single crochet 3sts. Bind off. Weave in all the yarn tail ends from the icords. Gently gather all 6 icords at the center. Using tapestry needle and yarn, secure all 6 icords together at the center. Weave ends in. 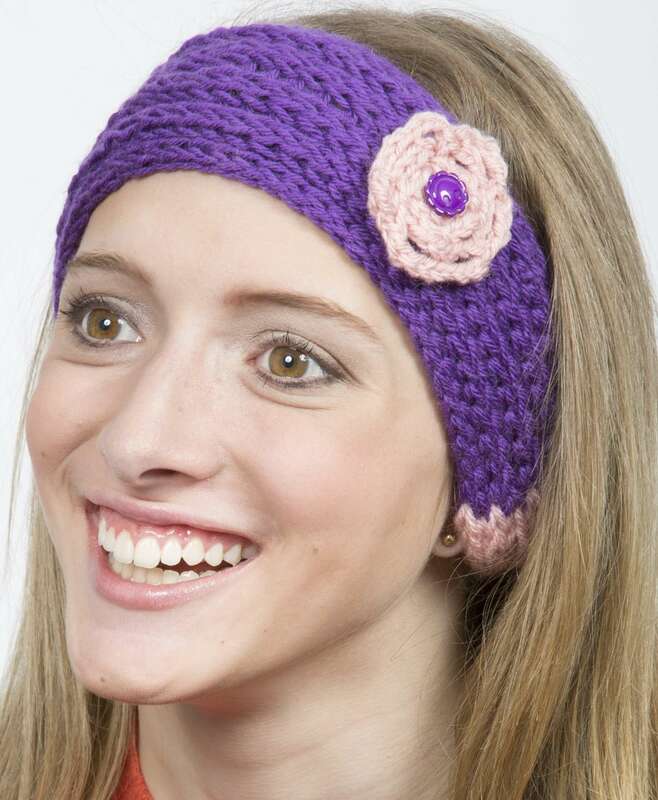 Optional: add a decorative bead to the center of the headband. 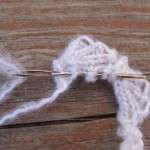 In regards to the icords; how do you cut the yarn and then join with the next peg? Thanks! I so love these, thanks for sharing. Just cut the yarn leaving a 6 inch tail. 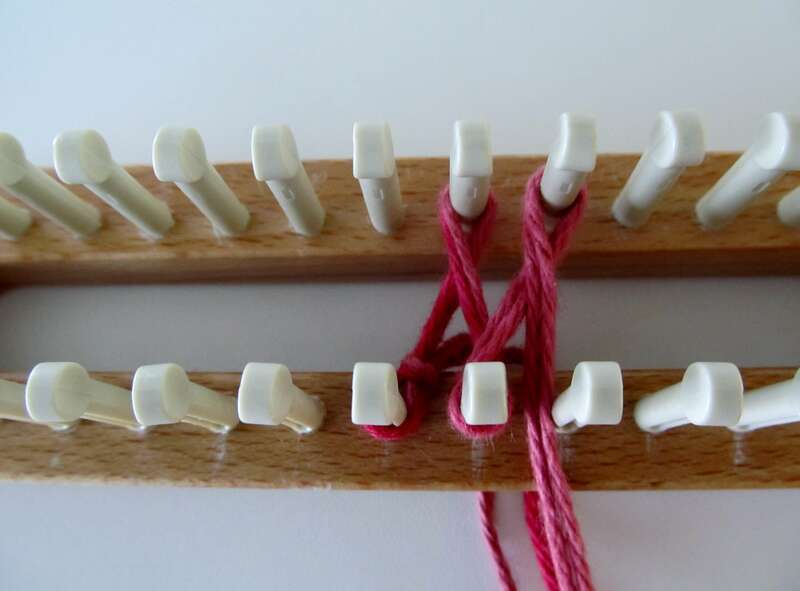 Join to the next peg by making a slip knot and placing it on the peg. 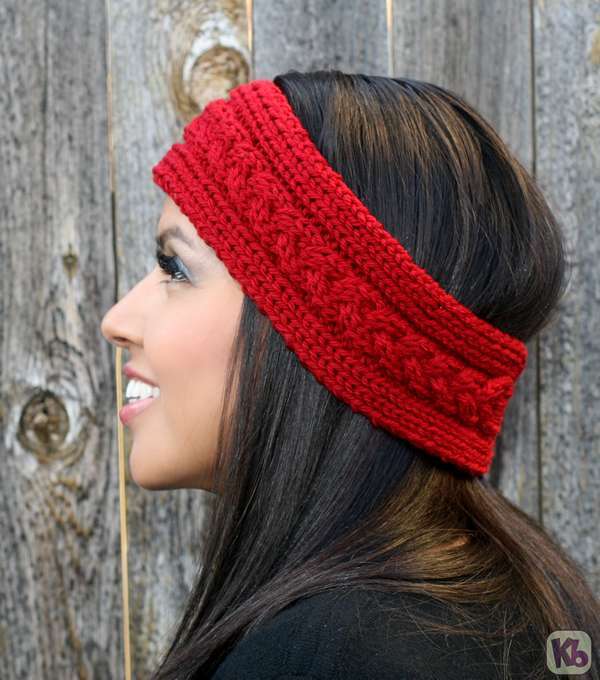 Which knit stitch is being used in the Lulu Headband? 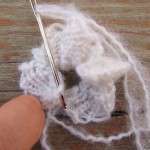 The knit stitch (opposite of a purl stitch). 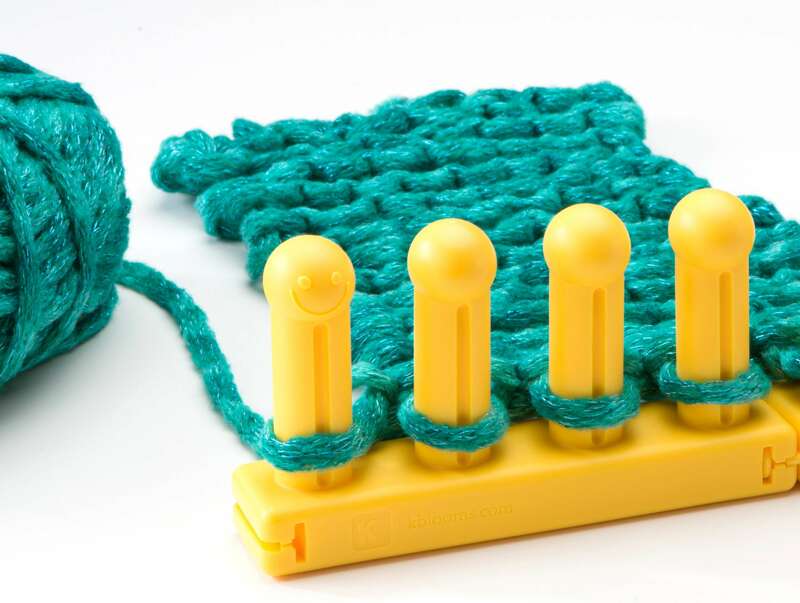 If they have small gauge enough, such as the AiO knitting loom. 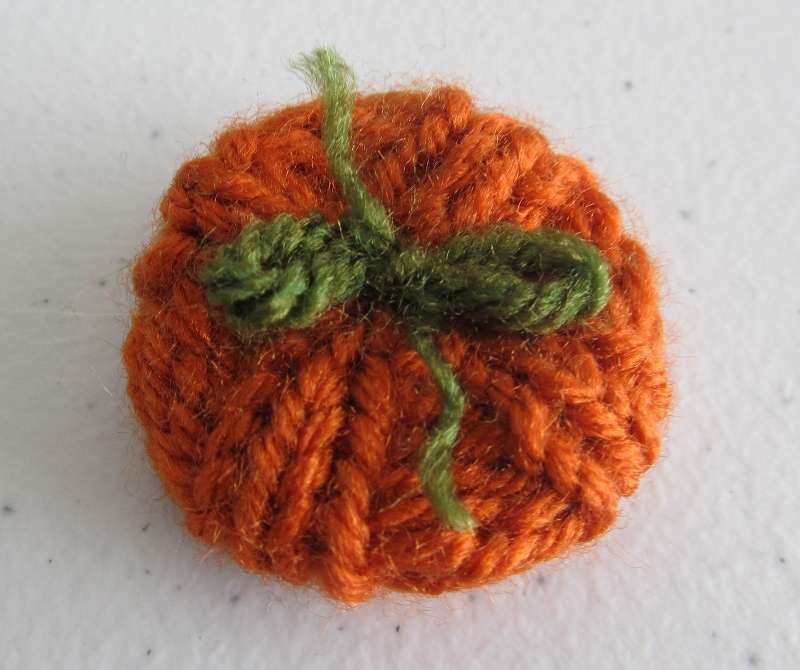 Easy and Quick to knit up. School colors make it outstanding. Everyone needs to keep their ears warm when ole’ winter comes again, and look so cute at the same time. Our warm headband is knit with 2 colors of worsted weight yarn, partial skeins and adorned with a simple crochet flower and secured with a ½” button. Yarn: Lion Brand Vanna’s Choice, 100% acrylic worsted weight was used. 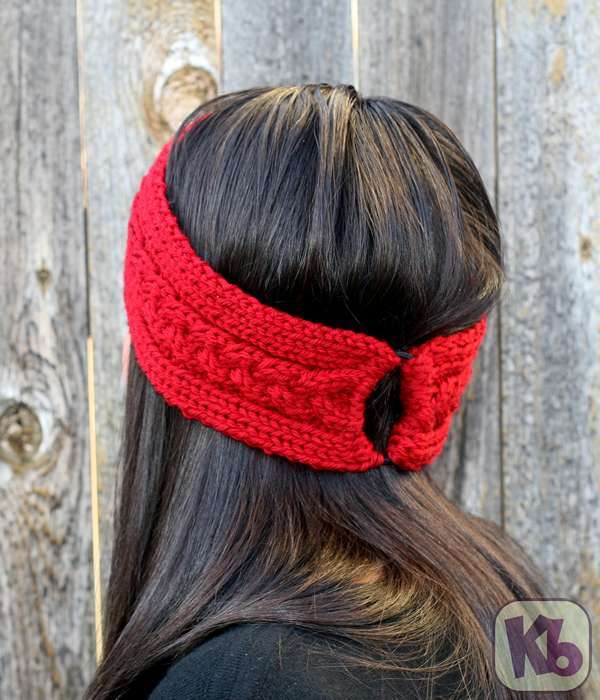 This headband only requires 1/2 skein of each yarn, so any washable worsted weight yarn should do a great job. Size: 20” stretched slightly and is 3.5” wide. This should fit most young girls. 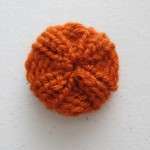 Notions Needed: Knit hook, crochet hook, (1) button, 1/2″ . Cast On (4) stitches in stockinette with pink yarn. Lay anchor yarn of any yarn. 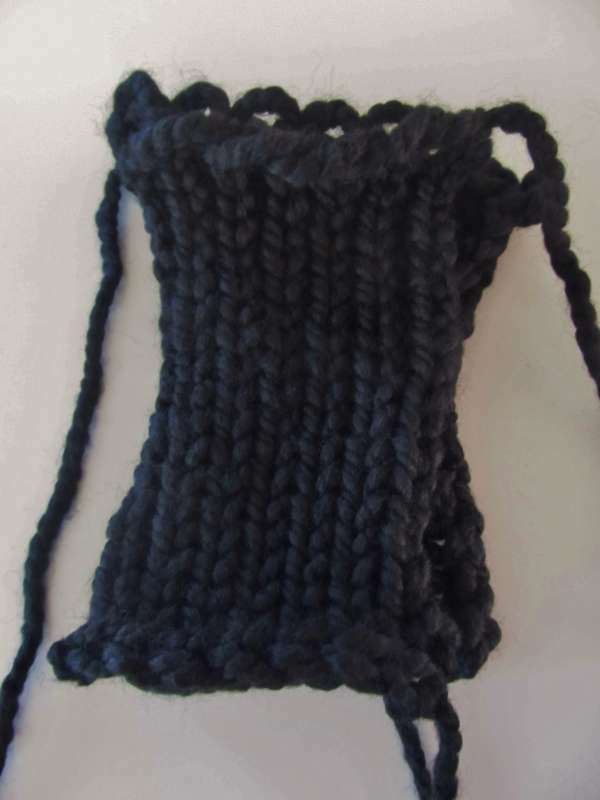 Work in stockinette stitch for (6) rows. Increase row: Move stitch #1 over to empty pin. Lift previous stitch from pin #2 onto the empty pin. Do this to both sides of loom and both ends. You now have 2 additional stitches on loom. Weave all pins and hook over. Work (1) increase row and (1) regular row. Repeat these (2) rows 3 more times so that there are (12) sts on the loom. Once you have (12) stitches on loom, you are ready to change to 2nd color yarn (purple) and knit in rib stitch. Cut yarn with 3-4” tail. Tie on 2nd yarn at 2nd pin, attaching to pink yarn. Trim and tuck this yarn tail. 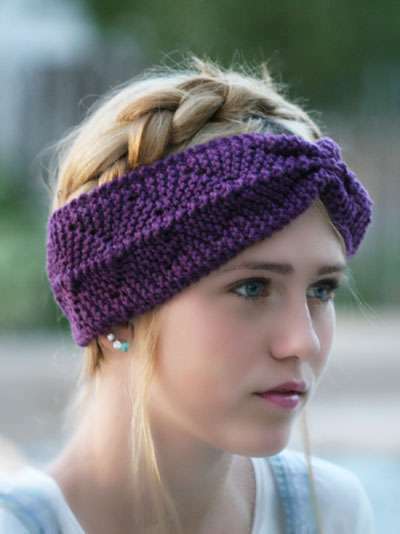 Work in rib stitch for 38 rows or until the center of headband is as long as you want it. Cut 2nd yarn and tie the 1st yarn back on. 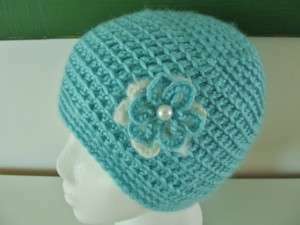 Change to stockinette stitch for remainder of headband. Work this section same as beginning section except do decrease rows rather than increase rows, so that you end up with only (4) stitches. Decrease row: Place the 2nd loop onto 3rd pin. Place the 1st loop onto empty pin. Do this to both sides of loom and both ends. You now have 2 sts less on loom. Weave all pins and hook over being sure to pick up both loops on 2nd pins. This will leave (1) loop on all pins. Work (1) decrease row and (1) regular row. Repeat these (2) rows 3 more times so that there are (4) sts on the loom. Work (6) rows in stockinette stitch. Bind off. Tuck yarn tail into knit. Bind off at anchor yarn. 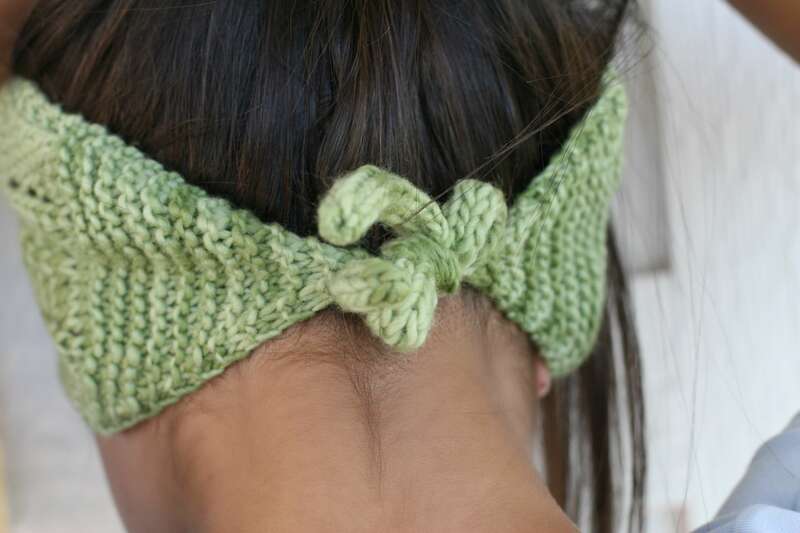 Sew the (2) short ends with 4 sts together to close up the headband. 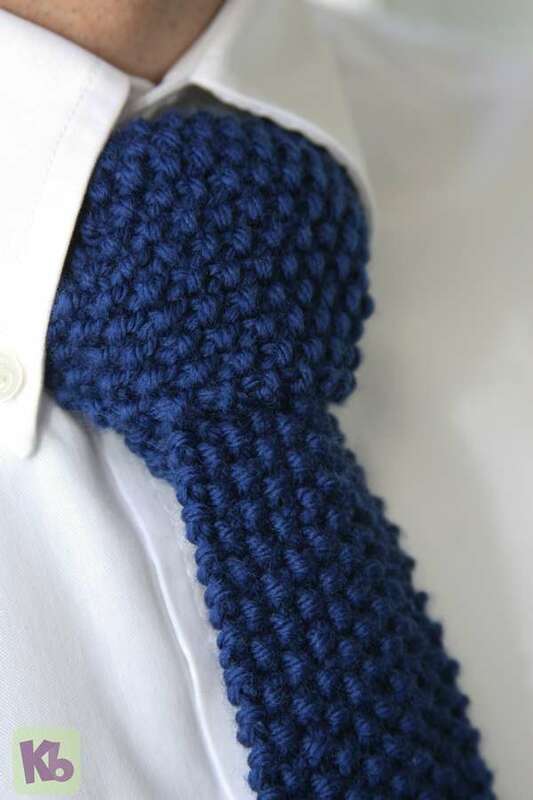 The most thoughtful gifts are those that come from the heart, those that we take the time to put our love into them, this Father’s Day, knit Dad a tie in his favorite color. Yarn: Approx 100 yds of worsted weight yarn in cotton blend. Sample used Knit Picks Comfy in Worsted, color Planetarium. Gauge: 10 sts x 19 rows= 2 inches in seed stitch. Size: Approx—60 inches long by 2.5 inches (at widest point). 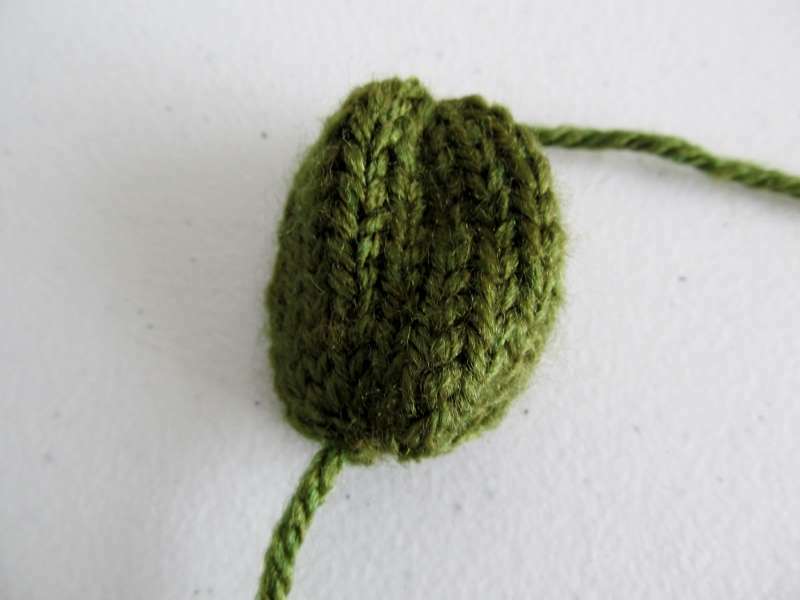 M1=Make one—to create an increase in the knitting. Reach for the bar between the two stitches, twist the bar, place the bar on the empty peg thus creating an extra stitch. Note: you will need to move the stitches outwards to create the empty peg needed for the increase; move the stitches first, then create the increase with the M1 method. CDD=central double decrease, knit three stitches together. Move stitch from the peg on the left to the center peg, move the stitch from the peg on the right to the center peg. Work/knit all loops as one loop. 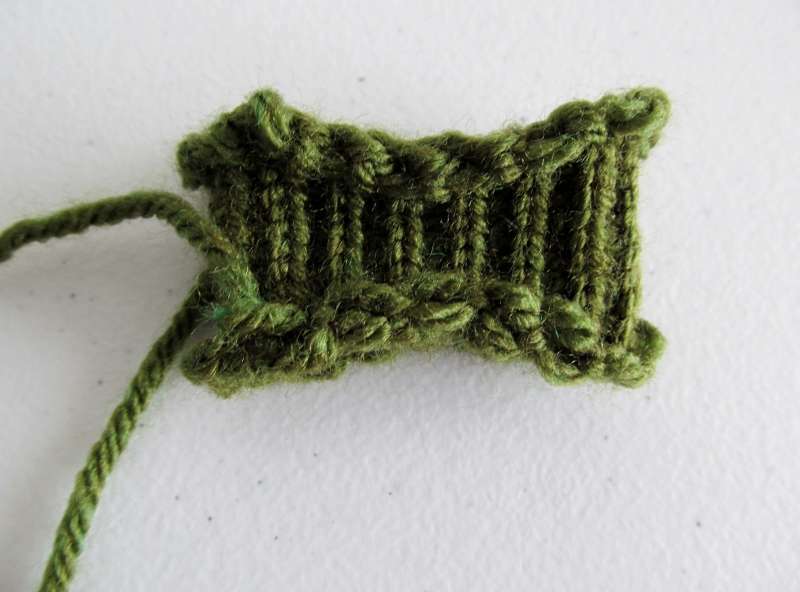 In this pattern—move all the other stitches inwards so there are no empty pegs. 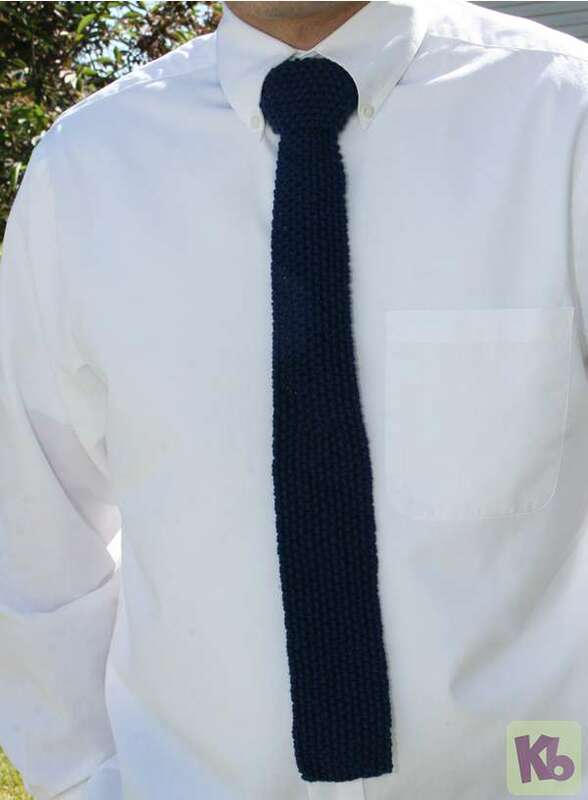 Pattern note: we recommend using a cotton base yarn so the tie has little elasticity, so it is easier to tie the knot and slide the knot up and down. The seed stitch used throughout the tie, keeps the tie from rolling up. Cast on 7 sts, prepare to work a flat panel. Row 1: *k1, p1; rep from * to last st, k1. Row 2: *p1, k1; rep from * to last st, p1. Rep Rows 1 and 2 until it measures 18 inches from cast on edge. Next row is a decrease row to create the thinner part of the tie that goes around the neck. Next row: k1, p1, CDD, p1, k1 (5 sts rem). Next row: *p1, k1; rep from * to last st, p1. Next row: *k1, p1; rep from * to last st, k1. Rep last two rows, for 10 inches. 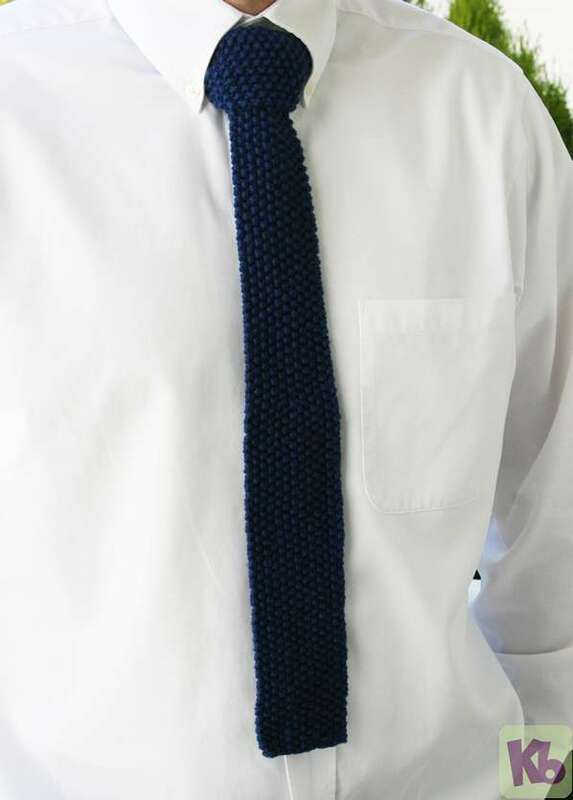 On the next clockwise row, create an increase row to begin the wider part of the tie. Next row: k1, p1, m1, p1, m1, p1, k1 (7 sts on the loom). Rep last two rows for 4 inches. 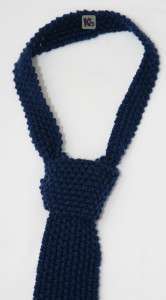 On the next clockwise row, create an increase row to continue the wider part of the tie. Next row: k1, p1, k1, m1, p1, m1, k1, p1, k1 (9sts on the loom). Rep last two rows for 6 inches. Next row: k1, p1, k1, p1, m1, k1, m1, p1, k1, p1, k1. (11sts on the loom). Repeat last 2 rows for 8 inches. Next row: k1, p1, k1, p1, k1, m1, p1, m1, k1, p1, k1, p1, k1. (13sts on the loom). Repeat last 2 rows for 14 inches. Bind off with basic bind off method. Weave ends in. Block lightly.